As the reader will recall, the plan was to now scout the rest of the galaxy in order to find the remaining AIP reducers and do away with them in a blaze of fiery death, and for this I had the mark 1 and 2 scouts and scout starships. I had the advantage that the exit warp lanes from cluster 2 led not only to cluster 3, but to cluster 4 as well, so only cluster 5 was distant. Thus it should come as little surprise that I had my first hits fairly quickly, finding another Co-Processor and a Data Centre in cluster 3, but after that my luck seemed to fail me. It took several hours, including neutering a signficant path through clusters 2 and 3 to allow scouts access without AI Tachyon coverage before I found my next hit, a Data Centre deep in the heart of cluster 5. A Data Centre that also featured a Spire Archive. 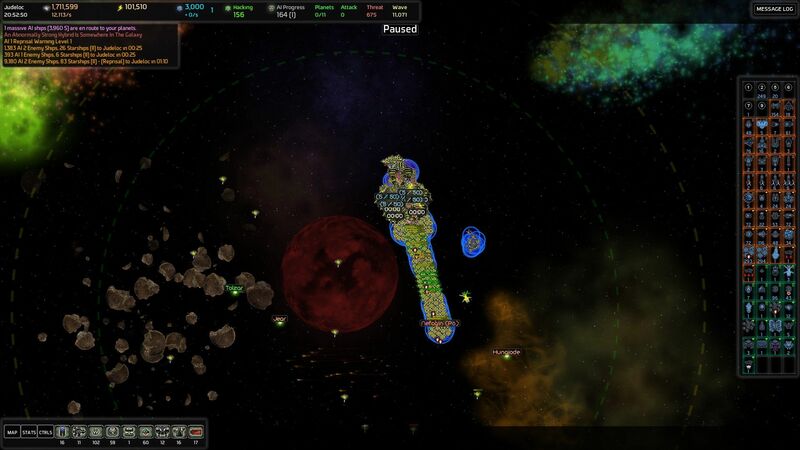 As can be seen on the map, I was getting rather far from my homeworld when neutering planets to allow further advance. In fact, the AI considered me to have been deepstriking for 5 provinces at my furthest neutralisation expedition, 9 warps from the homeworld. Now, don't get me wrong, I don't mind deep striking all that much, as it arguably just adds to the load of ships I have to bleed off anyway to keep the special forces under control, but on the other hand, it is rather more work to bleed the AI forces and increases the risk of fatal miscalculations, allowing the AI to build up forces too much when my navy is at the far end of the string of neutered planets, far from home. 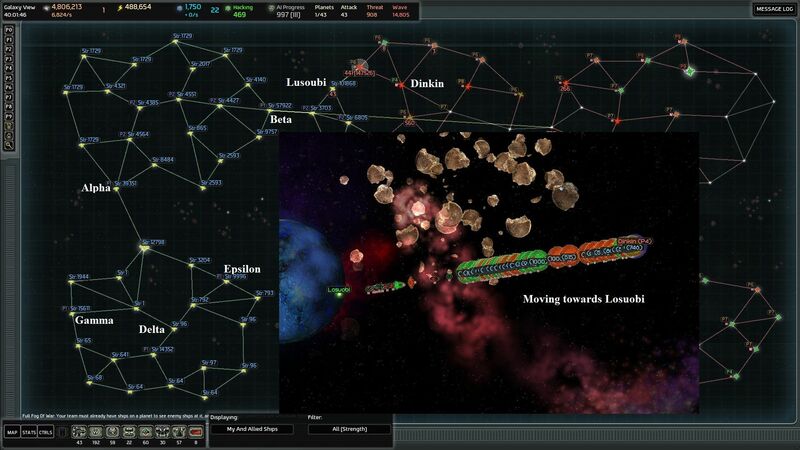 Even using the shortest possible route, which would have included blasting through cluster 4 and taking out a raid engine, the Data Centre was 13 warp jumps from homeworld, and would have required deepstriking throughout the passage through nine of those, unless I started unlocking more cloaking and began examining the options of trying to smuggle ships all the way while destroying Tachyon Sentinels. Even if I did that, and even if it worked out, I was left with the unpalatable fact that given that I had completed the scouting of cluster 2 and much of clusters 4 and 5, that Data Centre was the closest of the remaining Data Centres and the two missing Co-Processors. I decided that I'd set up a planet closer to the target from which to launch my deepstrikes, knowing that the AI would blow its to smithereens when my back was turned, but that by having a cloaker starship there with reconstructors and a few engineers I'd be able to rebuild it quickly whenever I needed it. The knowledge gained from the planet would be held in reserve for a while, just in case it turned out that I needed to try the cloaked approach anyhow. 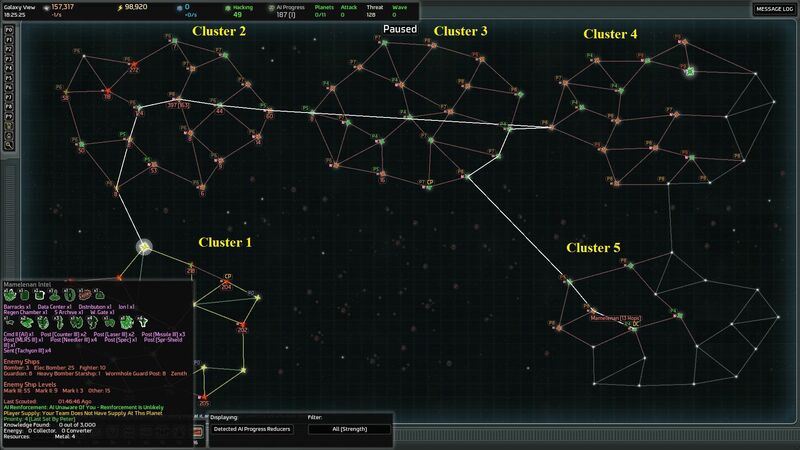 An obvious candidate was the entry planet cluster 3 coming from cluster 2, as it had an ARS and would ensure that the entire route from my homeworld to this planet was outside deepstrike range. Now, under other circumstances I would have wanted to hack that ARS! Its default choice was Spire Maws, which I had not tried before, but, being short ranged ships, did not fit well with my overall fleet concept. The ARS also offered Grenade Launchers and Viral Shredder, and the Grenade Launchers seemed ideal. Unfortunately, due to the difficulties at hacking discovered earlier, I had decided to perform no further hacking except as a last resort, so I decided to look on the bright side: If I weren't going to be hacking anyway, unlocking an extra ship type and getting 500 bonus knowledge would definitely be a boon regardless of the ship type. Plus, of course, I'd get to learn how Spire Maws functioned – and learning something new is always a worthy bonus. Be that as it may, this all proceeded according to plan, and when in due time the foothold was destroyed, I had a revelation: Deepstrikes did not work the way I thought they did. 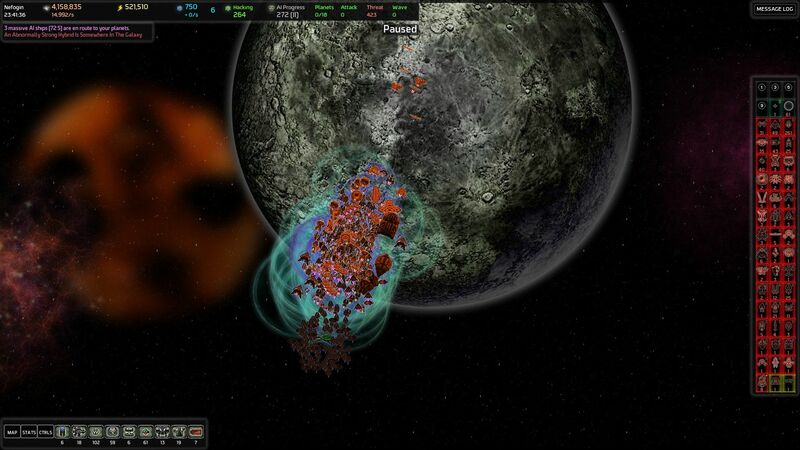 Let me explain my mistake: Based on previous observations, I had concluded that the AI counted any hostile activity on an AI controlled planet that was more than four jumps away from a player controlled planet as a deepstrike. I was predisposed to reaching this conclusion, because that fit well with my preconceptions of a deep strike in war being, strategically, a strike deep behind the borders between combatants. When I thus lost control of the foothold planet, I expected deep strikes to once again be counted from my homeworld, where the border was. But that's not how it works in AI War. 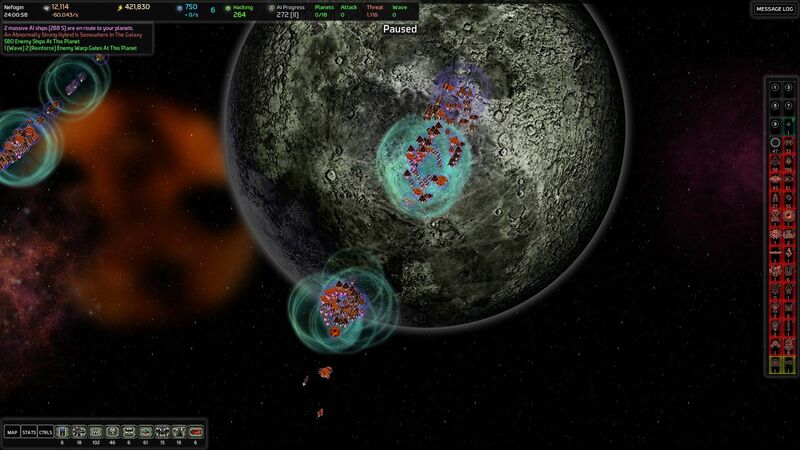 In this game, a deep strike is any hostile activity in any AI controlled system that is more than four jumps away from any planet that the AI does not control, not from any planet under player control. That's a very important distinction that I estimate could have saved me 40-50 minutes of work in the previous neutralization campaigns. 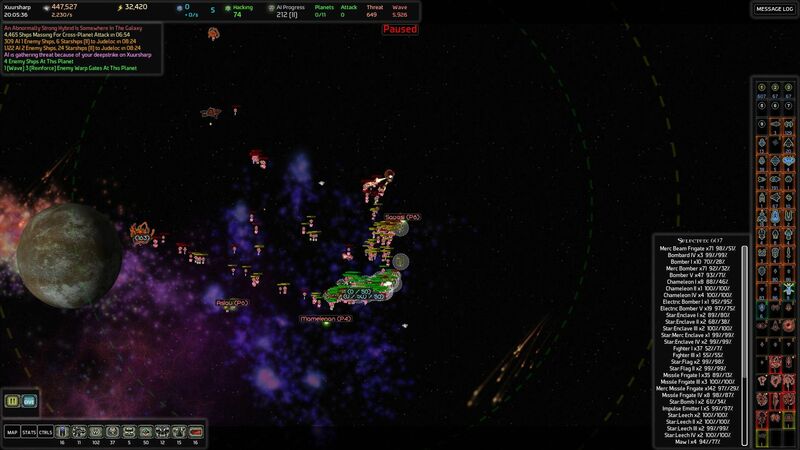 Knock out any command station, and all planets within four warps of it count as not being deepstrike territory. Knowing this, however, made the next step much easier. I'd knock out the command centre on the planet next to the Data Centre in cluster 5, and between the two footholds, that I'd now not actually have to hold, only a few very remote planets would be considered deepstrike territory by the AI. If it weren't for overconfidence, life would be more boring. 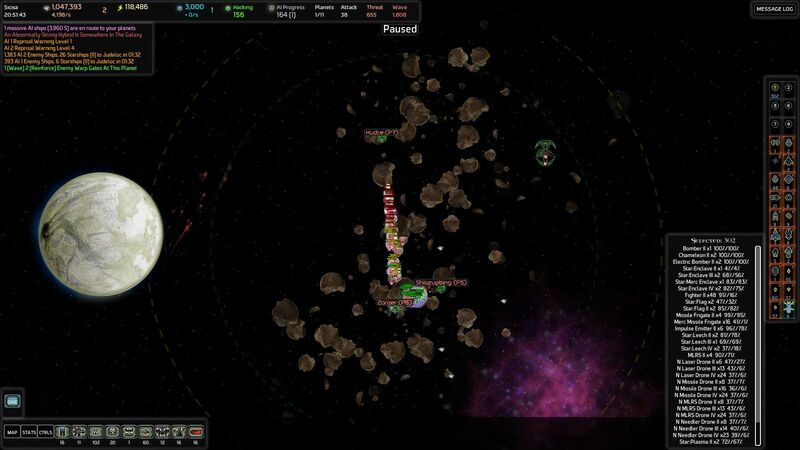 My fleet had reached the location of the second foothold and was busy reducing the opposition when the AI kindly notified me that it was time for another Cross Planet Attack. Now, the safe thing to do would be to retreat all the way back to the homeworld, wait for the CPA, clear out the CPA and the special forces, and then return, but I was getting a little bit bored with playing it entirely safe and deemed that a minor risk could be taken. I'd spend the knowledge from the footholds on even more defenses and just continue operating in cluster 5 until I was done. I was so close to having it all scouted, after all, and the fleet was in position to take out the remaining Data Centres and then getting started on the Co-Processors. So I scouted a bit more and I was on my merry way to destroy yet another Data Centre, when the CPA arrived and suddenly, or so it seemed to me, I noticed that the threat meter said 4536. Okay, not good, but they'd probably just wait in Spire Hub Alpha (nee Nefogin) rather than attack. And then again, perhaps not. 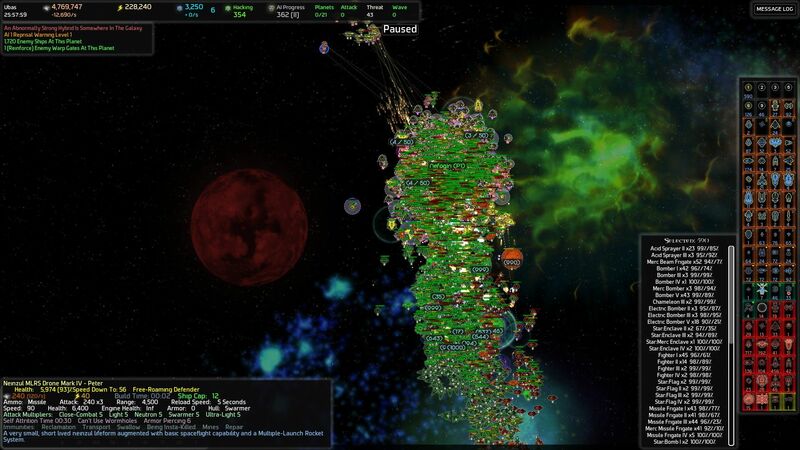 The AI had announced a 2.8k reprisal wave to hit within two minutes. There was no way in hell for the fleet to return in time to take part in the battle to come. I'd just have to proceed with the mission and leave the defense of the homeworld to the very substantial fixed defenses and my arsenal of warheads. Which I did, for a very modest +2 AIP. I decided that, having destroyed six Data Centres, located two more, and discovered all four Co-Processors, the odds of finding more Data Centres in the few unscouted provinces in Cluster 4 were probably minimal, and as they were all provinces behind a Dire Guardian Lair, I didn't really feel like making the effort to take them out. Also, the CPA had reminded me in the best possible way that I was operating on the end of a very long supply line. It was time to call an end to operations. The first step was blasting the two remaining Data Centres, which took a matter of minutes. The next was the Co-Processors, and that required a bit more thought. One of the Co-Processors in cluster 5 was adjacent to the AI1 (Special Forces Captain/Bouncer) homeworld, and that homeworld hosted a Hunter/Killer factory. As I had never fought a Hunter/Killer before, I didn't really know what I was in for, but based on the name, it seemed likely that it was nasty. Still, how bad could it be? 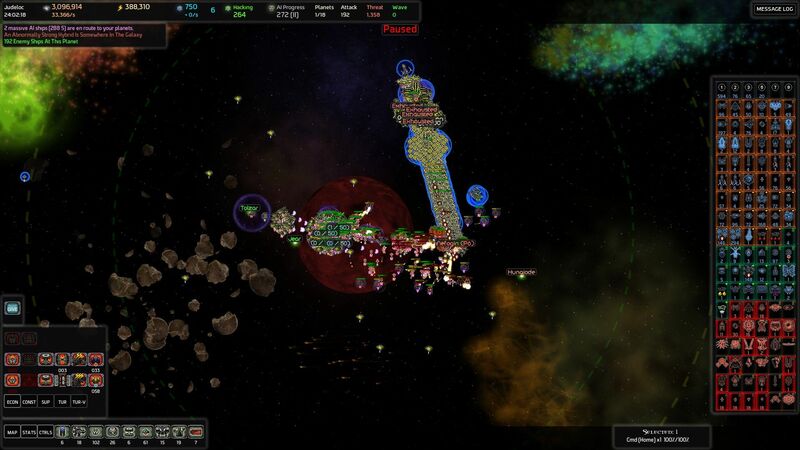 I had a very strong fleet. Built up over many hours, it had nearly full caps of the mercenary beam and missile frigates in addition to perhaps 80% of my normal caps and all starships were operational. 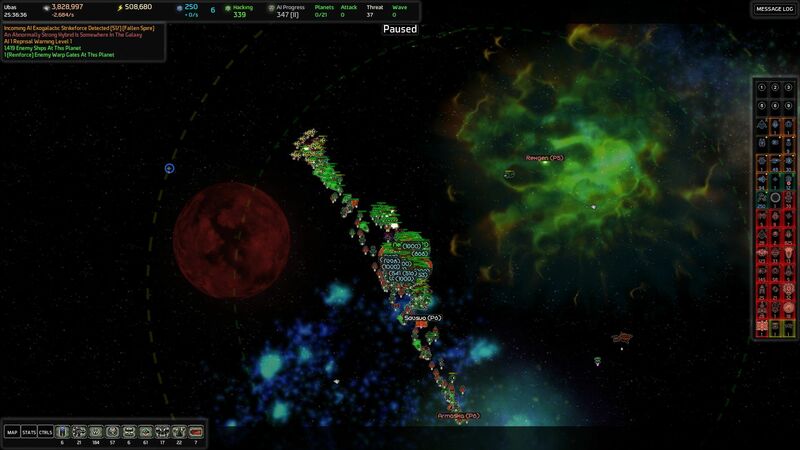 If I started out destroying the second CP in cluster 5, then the CP right next to the homeworld, and then fled at full group move speed back to the cluster 3 CP, hitting that one at the same time as I took out the CP in my home cluster, cluster 1, then the AI reduction would be done in no time and my navy could sail leisurely back to the homeworld and we'd all have tea and biscuits awaiting the Hunter/Killer, which would be destroyed upon arrival! And then again, perhaps not. Perhaps a better plan would have been to destroy the easy-to-kill cluster 5 Co-Processor and leave a tiny cloaked strikeforce ready to kill the hard-to-kill, send the navy back to the cluster 3 Co-Processor, and then take out the cluster 1, 3, and 5 Co-Processors in one fell swoop, with the fleet already halfway home. But I didn't make that plan, because I just wanted to get it over with. You see, in the midst of gloating I'd sort of forgotten the special forces and how it was, by now, quite some time since I had last pruned them. I'd been operating the navy far from home for a very considerable amount of time and they had not come swooping in, so I assumed they were still too few in number to seriously endanger my fleet. As it turned out, this was not entirely the case. I blasted the Co-Processor, and began the stately group-move back to cluster 3, pursued by vengeful forces from the core planet, but nothing I couldn't handle. No Hunter/Killer showed up, so I concluded that it too moved at a stately pace. Unfortunately, with my fleet engaged and somewhat weakened by the many battles it had been in on this major operation, the special forces, hybrids, and god knows what else began moving in from all directions. The stately flight back to cluster three became a running fight through every system, with ever more of the navy destroyed or crippled so it couldn't keep up. It was only five, a mere five, warp jumps to the cluster 3 Co-Processor from the Cluster 5 hard-to-kill where the pursuit started, but by the time the ragged remnants of my fleet arrived, the vast majority of its fleetships, most of its mercenary ships (the mind shudders to think of the metal cost involved in losing nearly full caps of mercenary beam and missile frigates! ), and a substantial amount of the starships had been destroyed, and what hadn't been destroyed was sorely damaged. Still, it was enough. The cluster 3 and cluster 1 Co-Processors died and my AIP went way down, all the way to 164. Unsurprising, the vast casualties I had suffered had increased the AI reprisal levels, so at this point, knowing that the AI forces in pursuit would be arriving any second, I gave up on fleet cohesion and ordered the remaining ships to make top individual speed for my homeworld, 9 warp jumps away. Fortunately, my engineers had been busy as bees, rebuilding the fleet at the homeworld as the far signals fell silent, one by one. While the new fleet was short on starships, it had managed to churn out all the sentinel frigates before the enemy arrived and was gamefully working on the other fleetships. With a total of 10,956 fleetships, 115 starships, and the Hunter/Killer incoming, it was obvious what I had to do. Once again, it was time to unleash the lightning. When the dreaded Hunter/Killer finally arrived, it was a terrible anti-climax as the three waves that preceded it had all been shredded. It died in a hail of fire in seconds. 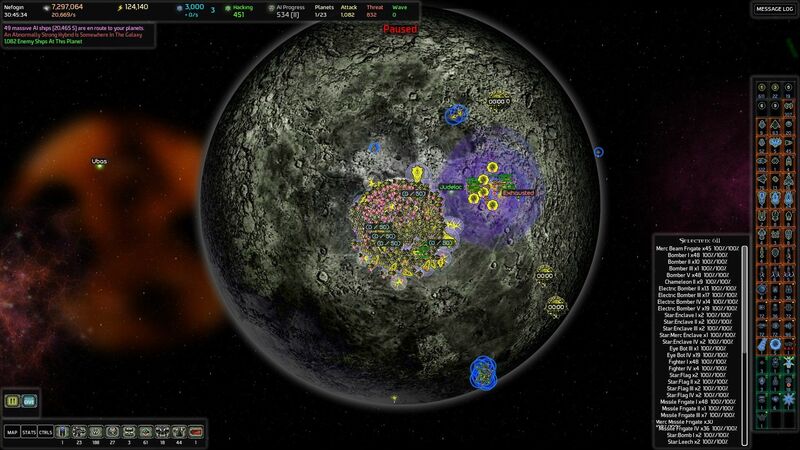 My little star empire had survived and that marked the end of phase 2's objectives. I had also located both Spire Archives close to the Special Forces Captain's homeworld, but with the special forces wandering all over the place, I really didn't feel like risking taking over the Spire Archives so far from home with Warp Jammer stations and then a) surviving for the duration of draining the archive, and b) leaving the Warp Jammers alone afterwards – what if they were accidentally encountered by wandering special forces, destroyed, and then put the core worlds on permanent alert? Under the circumstances, and with the recent chase fresh in memory, I decided to leave well enough alone. There'd be more than enough knowledge gained through outright conquest in this Fallen Spire game! I regret to say that it was somewhat against the original spirit of the challenge, which would have me conquering all over the place as soon as possible, and more in line with a normal AI war game in keeping careful control of AIP for the longest time. Alas. Perhaps the appropriate degree of broad-stroke map-painting will become possible later in the FS progression. The hubs, at least, will become more fearsome as soon as I get one of those rare round tuits. Been behind the eight-ball on multiple projects this week, but it's starting to pan out. Hoping to get 7.034 out Saturday noonish eastern-time. I do plan on going with something like we discussed; we'll see if it in any way lines up with the temporally-altered world of Ride The Lightning. They're excellent for eating waves/etc up to a certain size, though you may already be dealing in magnitudes that would cause them indigestion. Ah, yea. 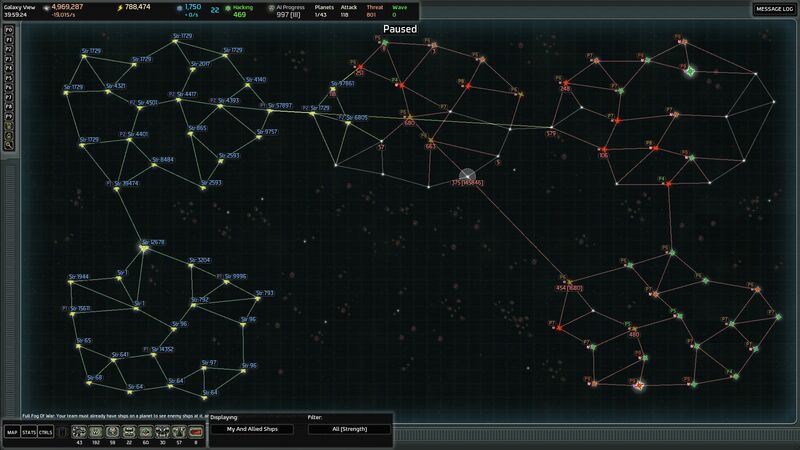 Neutral planets counting is a very helpful thing to know The AI's disinformation campaign does its best on that one. The AI sent a thank-you card but it got lost in the reprisal wave. "The fleet was delicious, though perhaps try a bit less salt next time." Nothing survives high-magnitude focus fire. But H/Ks are definitely some of the nastiest customers in the game. One with enough screen to range on you is an immediate threat of game-over, as even the single one can shred an FF net in an alarmingly small amount of time. But like all problems it does respond very well to the universal solvent: overwhelming firepower. Then loaded your HACK_TEST.sav and started an ARS hack on Ubas. 1) Your setup now holds through the entire hack with zero player intervention. 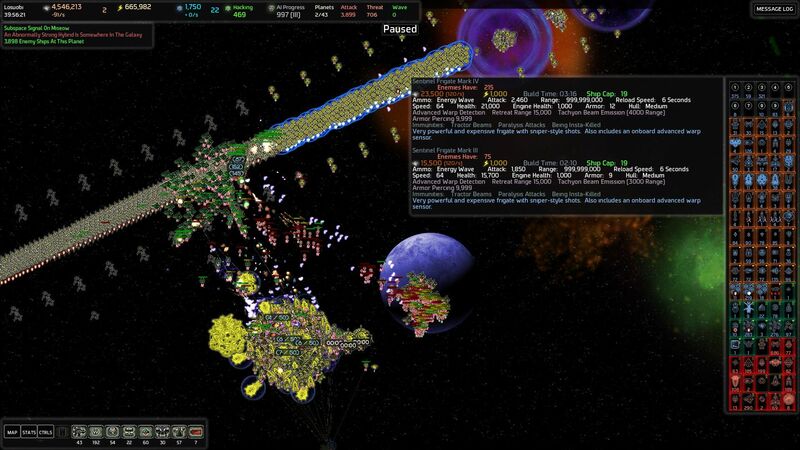 Though the combined hack response and SF flood do frequently reach your fleet ball before dying back. 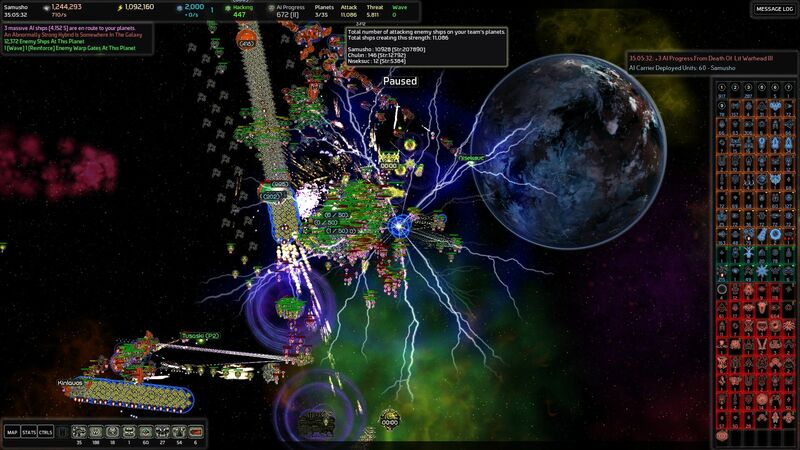 2) During this about 9000 ships (between two normal waves) hit Nefogin, which also repulsed the attack without player intervention but did lose the command station (and one spire building) there at the end due to massed fire from an unhealthy number of AI spire starships and bomber starships. 3) After the ARS hack completed I started a knowledge hackon Ubas without repairing or whatever anything, and it got about 900 knowledge before something managed to kill the extractor (though your overall setup still held strong). Then the FS exo launched and I figured further hacking would be contraindicated. So basically with that high a total-HaP-earned it was riding the "floor" of 100 + (the rest / 10) that I put in to make sure the minimum response always increased _somewhat_ with spent HaP. Anyway, this looking reasonable for further testing? Sounds reasonable, under the assumption that it should be at all possible to hack at that level. mmm... That must have been with those spire city buffs you were talking about? I'm deeply surprised if my HACK setup was capable of rebuffing 9000 ships on its own without suffering existential failure... unless, wait, you are talking in several waves between the normal waves, which makes a difference... And yes, the Mad Bomber brings an unhealthy amount of spire, bomber, and plasma starships to my systems on a regular basis, which the fixed defenses are not at all guaranteed to handle without fleet support. Perfectly understandable what you mean, of course, but I love clean debug for easier log sorting. That is rather a lot of hacking balance to have, so perhaps hugging the floor at that point is acceptable, and just a few hacks would rapidly erode the hacking balance based on the increasing cost of similar types of hacks. In a Fallen Spire game, with lots of hacking balance and targets to go around - but also with much less individual impact from most hacks when compared to the overall situation than in normal low AIP games - just about any amount of hacking balance can be used and it will definitely be tempting not to keep such a high balance (and hence hugging the floor) and instead use it on acquiring stuff like fabricators, controllers, design corruption (oh, this, so very, very, much), or the occasional infrastructure hack. 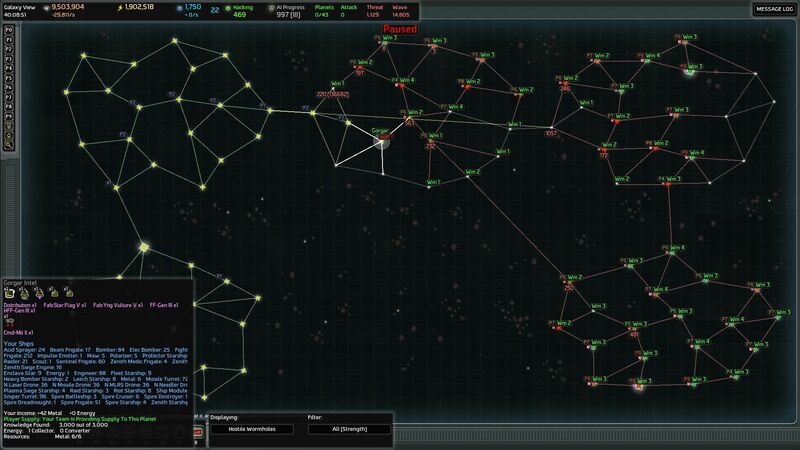 An obvious consideration is that it potentially allows for spending significantly more on superterminal hacks in a large-scale conquest game, FS or not. OTOH, the tick cost increases every 20 ticks, so that's to a large degree self-correcting, and if you continue up to the limit, you'll have to go on a significant conquest spree afterwards not to sink yourself with further hacks - but you do have that option. So that's probably not going to be a balance problem - the major result being that you don't automatically sink yourself if you hack the ST early for lots of points. The bigger question is how it plays out in 7.0 or 10.0 in "normal" games, I guess. It is probably generous for 7.0 - compare e.g. my 7.0 victory from week 2 of playing, where I ended up with 1080 AIProgressionTotal (which I understand is not normal, but is a data point to remember), but on the other hand, being generous at 7.0 is not necessarily a vice, and not punishing players who want a "normal" gaming experience overmuch for spending their HaP rather than husbanding it and only picking the ideal hacks to minimize expenditure is arguably a good thing. For one of your 10.0 minimum AIP super players, just how generous is this? What sort of AIProgressionTotal are we even talking about at the end of the game? 400? 500? And with the superterminal hacked, one assumes, which eats up a lot of points all by itself. No, without a couple of data sets from successful 10.0 games and an idea of how much is traditionally hacked there, there's really no way to know whether this is generous or the reverse not - I suggest you put it in the wild and have a few of them utterly abuse the system, then see just how bad it gets. ....after all, it is trivial to difficulty-scale the exponent to make the pain unbearable for any desired goal, should they need an extra challenge. mmm... That must have been with those spire city buffs you were talking about? Yep. A fully loaded carrier approaching all 6 photon lances is no longer serene. Carrier captains are now issued brown pants as standard equipment. 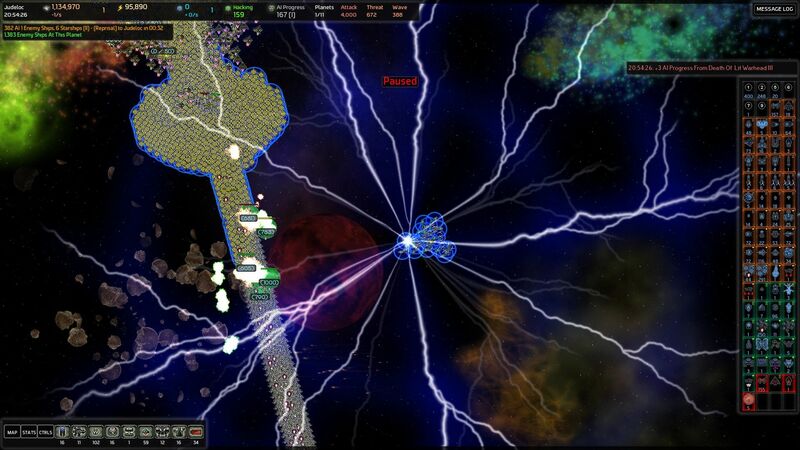 What I meant is that 2 normal waves were launched against Nefogin (not the hacking planet), and totalled 9000 ships. They didn't hit simultaneously, but only about 40 seconds apart, so it was basically a single attack. Other than a few targeting-the-hack-world small waves (triggered by the hacking) there weren't any other waves during the hack period. If the AI'd had another thousand or two ships in there I think they'd have broken through; as it was they went into retreat mode shortly after bringing the station down due to being down to 3-digit numbers. Rebuild my proud fleet of starships. Clean up outstanding special forces. And get on with phase 3 – preparing for the Spire Hub. So I began doing just that, conquering the planets in the interior, unlocking economic stations 2 and 3, and building up things according to plan. It is interesting how CPA's become less and less relevant as I increase in AIP gain. Take the last CPA before I built Spire Hub Gamma. Yes, it was roughly 5k ships or so, but given that just the two ordinary incoming waves were ~2.7k, and that the number of special forces roaming the galaxy and having to be culled on a regular basis dwarfed that, it really was hard to take the CPAs seriously. This trend was to become much, much, worse. 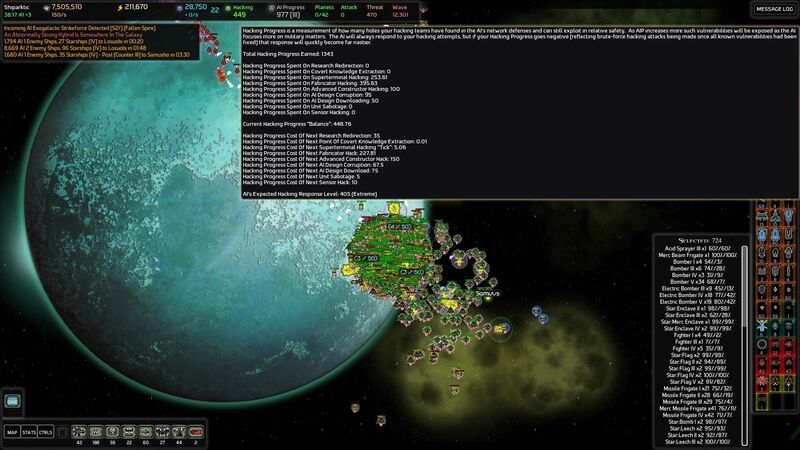 The screenshot shows the gallant fleet culling special forces. At last the time was right. Metal was near full, waves recently defeated, and everything was in preparation. I began construction in Spire Hub Gamma, safely in the interior, and the AI dutifully reacted by sending an exowave consisting of one each of armoured, cursed, and artilly golems with a few friends to keep them company. As Spire Hub Gamma was in friendly territory from the very beginning and I had lots of metal to build it up, it soon began searching for the next shard. 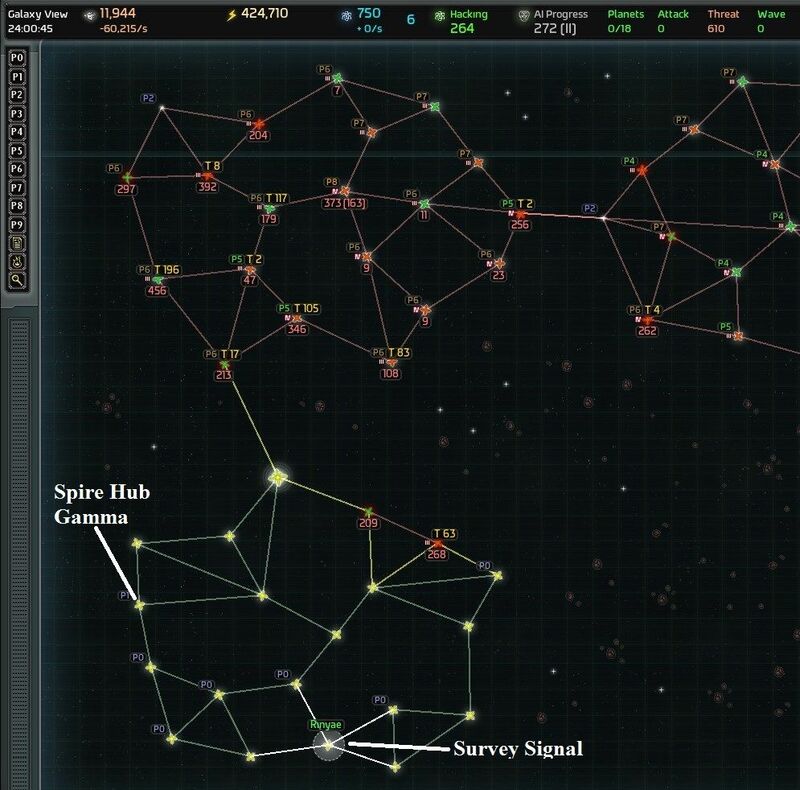 Twenty minutes after the huge first exowave triggered by Gamma, I was ready to start the next shard chase, which to my great fortune began in Rinyae, an interior system in cluster 1. With the fleet rebuilt and now boasting 12 spire frigates, 2 spire destroyers, and one spire cruiser, and with every incoming chaser having to pass directly through my homeworld, I saw no reason to wait. The fixed defenses would once again protect the home command system, while the mobile fleet covered the route between the homeworld's incoming wormhole and the wormhole to Tolzar, that both led by shortest path to Spire Hub Gamma and shortest path to the recovered shard. It was butchery of the first degree, the chase forces plunging into the deathtrap. That being said, it wasn't one-sided butchery. The following screenshot shows what happens to a threatball that's perfectly placed for interception, when the AI is determined to go straight through it no matter the cost. Be that as it may, with the shard recovered it was time – finally – to build Spire Hub Alpha. 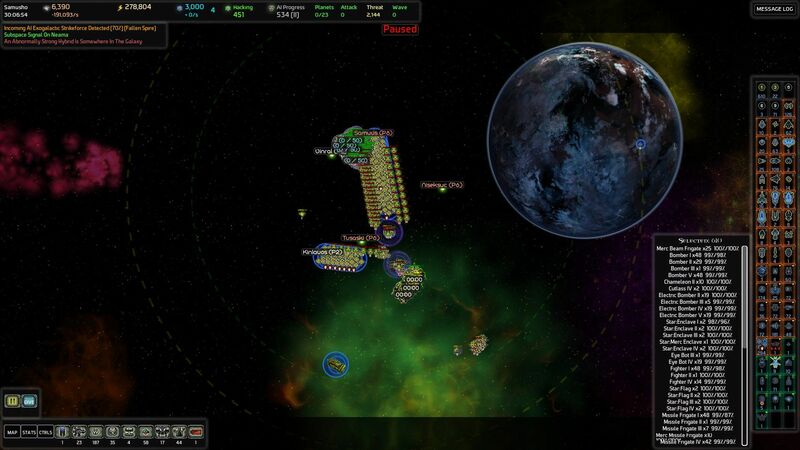 I conquered the last two AI planets in cluster 1 to clean house and unlock fort 2s, built turrets and forts in Nefogin, the Spire Hub Alpha location, and once that was done, sent out the fleet and the colony ship to take over the planet, build a military 3 station, and build the hub with three reactors to maximize defensive power, while building shipyards at Spire Hub Gamma. The Spire Fleet thus grew to 20 frigates, 4 destroyers, and 2 cruisers. THIS time I built the Spire Hub guarding my homeworld such that its shields only partially overlapped the warp gate to my homeworld – anything determined enough to batter down the shields would be able to get through after only battering them down to half strength or so, thus leaving itself at the mercy of the homeworld's fixed defenses, without having wiped out all of Alpha's defenses requiring an expensive rebuilding program. In the utmost extremity this would allow me to play defense in depth by first having my fleet make a stand at Spire Hub Alpha, then retreat to fight at the homeworld while Spire Hub Alpha's fixed defenses were still online and attritioning any incoming forces. I'd prefer to stop enemies hard at alpha, of course, but it was no longer a case of "stop them at alpha or have to rebuild the spire modules almost from scratch". The AI decided to synchronize the next CPA (I guess I was overdue one anyhow) with the next exowave, but what's a few thousand extra ships between friends? With my fleet defending Spire Hub Alpha, they stood no chance, though once again I was struck by the wimpiness of the spire when compared with the regular defenses and the fleet's damageoutput. I now had a fairly secure situation, tanking everything directly on Spire Hub Alpha incoming from a single wormhole, Rexgen, and though 12% salvage was a significant reduction from the 50% I had gotten used to, having the interior of cluster 1 full of economic stations of marks 2 and 3 had given me a very solid baseline income to work from. I was getting stronger, but I was reminded again that I was far from alone in the galaxy. With my increasing AIP, the special forces were rebuilding faster than ever: 20,000, give or take a few, hanging out three jumps from Spire Hub Alpha. 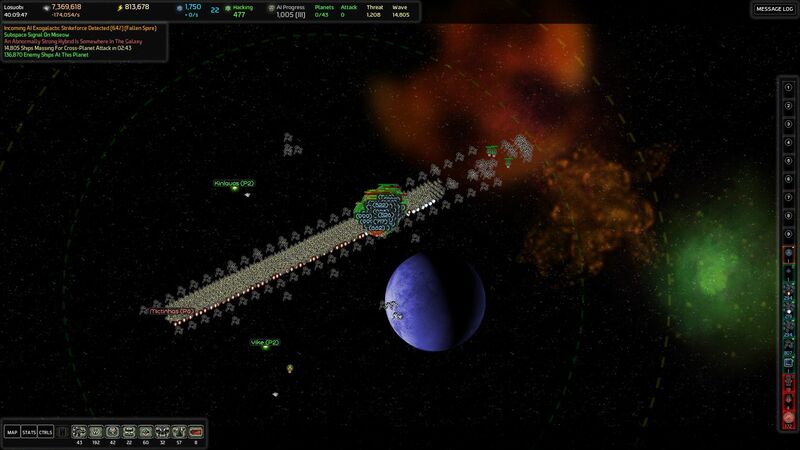 Now, I had been using hit and run attacks on Ubas, that had an ARS, to bleed the AI's special forces before, but with Spire Hub Alpha up and running just one warp jump away, I decided to do it one better by building a full set of turret defenses in Ubas and only then moving in the fleet to annoy the AI. As expected, the AI retaliated by sending in the special forces. This worked even better than expected, they just swarmed in and got shot up. 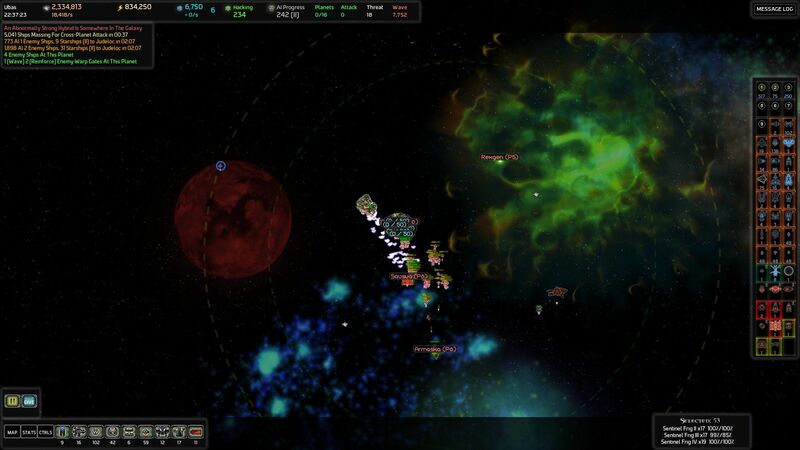 Then again, too much of a good thing is bad for you, so even with the fixed defenses in support, I was reduced to hit and run tactics – retreating when my fleet was about to be overrun, then returning again when replenished. Sometimes discretion is the better part of valour. To this very day, I still don't know how many special forces, hybrids, and whatever they may be or wherever they may come from ships the AI threw at me, as they kept piling on way beyond the original 20k I had spotted as the battle dragged on. Perhaps they were merely the replacement ships generated normally during that time? These are existential questions, but really... Who knows? Who cares? Kill them with fire! I do know that twenty minutes later, when I was still weeding out ships at Ubas, the enemy was down to 15 carriers. I don't rightly recall when I finally managed to kill them off at Ubas (only to start piling up somewhere else, of course), but I eventually did, and I began cleaning out planets for knowledge in order to prepare for the next step – setting up the intended Spire Hub Beta planet to tank waves, then building up Spire Hub Alpha to level 2, and getting started on Spire Hub beta. Playing AI War is a bit like playing whack-a-mole, only with armed moles, an ever increasing number of mole-holes to keep track of, a rubber mallet, and moles that smile knowingly at you all the time, even as the mallet descends. So there I was, merrily advancing my day of glory, with an 8.7k CPA hanging over my head and triggering a mark 3 counterattack post that got in the way, while returning my fleet to base, sending 2k Mad Bomber ships to my homeworld shortly before the CPA, when the AI decided to trigger normal waves from both AIs to hit simultaneously, that would arrive 1m 6s after the counterattack. Now, a word of caution here. When I say "normal" waves, I mean quite powerful waves, considering that I don't have any trader toys, champions, or Golems to back me up, only the base defenses. I'd hit 447 AIP, and AI1, the Special Forces Captain, thought nothing of sending in a couple of hundred Spire Stealth Battleships as part of its 2k forces, whereas AI2, the Mad Bomber, habitually sent a thousand Zenith Electric Bombers, a thousand Zenith Siege Engines, and a hundred starships (most bomber and plasma) as part of its 6k waves. At least I'd managed to design corrupt the Mad Bomber's Zenith Bombardment Ships. It might have resulted in a desperate struggle at the time, but without that, the Mad Bomber would probably have flattened me by now. In the current situation, my fixed defenses required fleet support to take on the Mad Bomber waves without most of the Spire Hub being flattened in the process. How can this be? I logged the waves after 400 AIP, and it turns out that to the base strength from AIP was only contributing 40% of the total strength that hit me in each wave – fully 60% of the strength hitting me in each wave came from reinforcements redirected to wavestrength and it was a rapidly increasing percentage with every AIP gain. Now, this is on difficulty 9, which is supposed to be hard, so the best I can say is that yes, by God, it is hard. Some of the many defensive toys introduced with the expansions would have significantly reduced the danger, had I had them enabled, so I am not sure it is too dangerous, being dependent on game setup. (As an example, awakening a Golem for 15 or 20 AIP always significantly increases defensive strength, whereas plundering a planet for 20 AIP and 3000 knowledge does not once the basic defenses have already been unlocked... If only I could unlock more mod-forts with knowledge). But very dangerous? Definitely. I shudder to think of what it'll be like in another few hundred AIP, and I can't help but wonder whether I'll end up having to burn lightning warheads on every incoming wave. It does have the curious side effect that with two spire hubs and 447 AIP, the regular waves are much more dangerous than exowaves or CPAs, which feels slightly backwards in what was supposed to play out more like a wargame of mass conquest. Because, thinking about it, how bad could it be? With only 71% progress on the next exowave, I'd have plenty of time to kill off the counterattack at the homeworld using the fleet, rush the fleet to Spire Hub Alpha, which would by then be heavily under attack by the 8.5k incoming waves, and I seriously doubted that the CPA would add in due to the huge threat value of my defenses + fleet. I might need to use a small mark 1 or 2 Lightning Warhead if there were particularly many SBS or Electric Bombers, but surely nothing more than that. That's when the CPA count hit zero, and rather than spawn the CPA, the AI decided to synchronize everything. 17 seconds to the counterattack on my homeworld, 1m 23s to double waves, exo wave, and CPA. 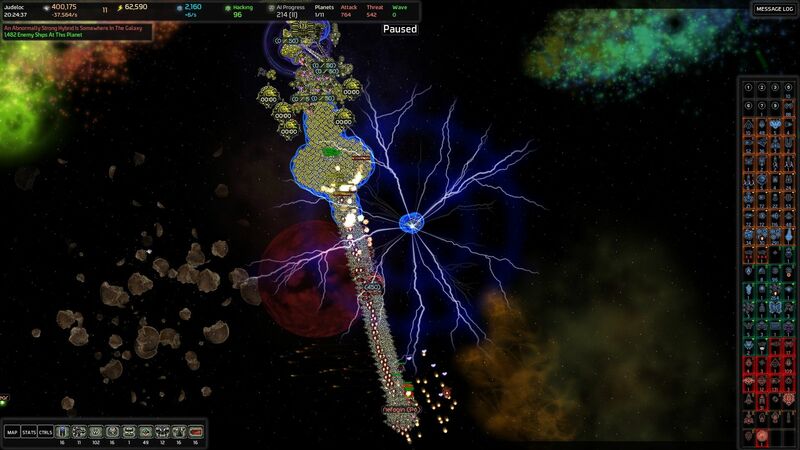 At the homeworld, the counterattack was defeated with some casualties and then ordered to set full speed for Spire Hub Alpha, where the slaughter was well underway as my fleet came charging out of the wormhole, I realized it was time to take stern measures before engaging, so I unleashed the lightning, once again. When the first mark 3 Lightning Warhead left 135,851 strength alive in Spire Hub Alpha and with even more ship strength as threat just one system out and more pouring in every second, I knew I was in for a serious fight. Fortunately, I had more warheads where they came from. And I now eagerly await the next patch, which sounds like it will address several of the issues uncovered. Rather heavy on defenses, but then, given the Mad Bomber, that's been a necessity. Yea, the waves growing so fast with AIP (due to the reinforcements redirect thing) tends to outpace it. I'd planned to have it redirect a certain % of the reinforcement redirect to CPAs instead, I forget if I actually pulled that off or if I deferred it until CPAs could be made strength-based rather than count-based. Anyway, yea, CPAs are the main threat in a totally non-superweapon game, particularly a low-AIP one. But as AIP gets higher and/or superweapons get involved the CPAs become more of a "coordinating" threat than one that can just knock you out by itself. That coordination is still relevant, though, as you discovered. 1) Major Premise: Ships do not survive being in the middle of a sun. 2) Minor Premise: There are lots of enemy ships, not flying into a sun. 3) Conclusion: Create new (short-lived) sun on top of the enemy ships. Quite possibly the best one-sentence description of the game to date. Shall have to forward that to our PR executor. Likely so. Between the reinforcements-redirect change and the spire city buffs the effect of normal waves will be very substantially easier at that AIP. Which leaves only one course of action: gain MOAR AIP. I'm guessing the difficulty-based reductions of the reinforcements -> waves mechanic in the latest patch will probably help, but if those aren't sufficient a couple of potential tweaks have occurred to me. Rather than having a hard cap of 200 AIP for reinforcements, it seems like the AI should gradually redirect further reinforcements to waves as AIP goes up. IE, as you go from 200 to 300 reinforcements keep going up but slower and slower, and then past 300 any further increases go to waves. That might be needlessly complicated, but the mechanic would kick in a bit slower and there'd be a bit more breathing room. Maybe in practice it already feels like a smooth transition, I haven't hit this mechanic yet. Using those example numbers, this would effectively cap reinforcements at 250 AIP. The old reinforcement cap for diff 7 was 245, IIRC (7*7*5). Also, what happens if you just beachhead the heck out of the SuperTerminal planet? The AI will deploy Strategic Reserve down to 90% to defend it, right? If you have a large enough beachhead to soak that much SR, then the excess reinforcements will go to the SR and immediately zerg your beachhead, reducing the SR back down to 90%. I'm not sure how often the SR will deploy, or how fast it refills due to reinforcements, but it seems like this would absorb a fair amount of the excess reinforcements before they can be added to waves. Granted, you're basically running a second whipping boy at this point, one that has to eat MkV SR 'waves' to boot, but with per-planet mkI-III turrets, that might be doable. Depends strongly on the minimum amount of SR the AI is willing to deploy at once. Keith, I remember seeing a patch note about 10% of the reinforcement->wave redirect going to CPAs instead. v7.026. The percent might need a buff. What the heck? I could have sworn LTFs were player-only, specifically because they're so OP for the AI in large numbers. Hybrids like to pat rules on the head and say "aw, isn't that cute". Patch 7.034 had arrived and I was eagerly looking forwards to the hacking changes, which implied that I'd be able to spend several hundred more HaP before it went critical. Moreover, the amount of extra reinforcements directed to waves had been reduced, which would come in handy, but of potentially greater overall importance to this particular game, spire cities were no longer supposed to be weaklings. Increased salvage and base metal production (yay! 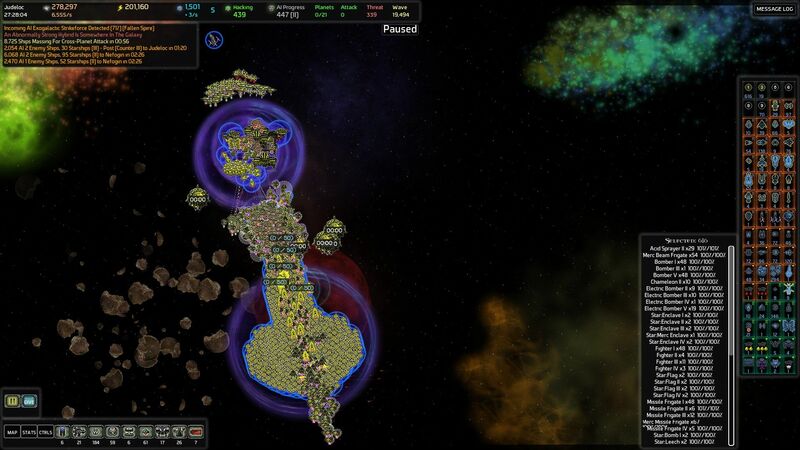 ), doubled range and quadrupled firepower and shields certainly sounded impressive, but before going gaga over it, it behooved me to take a look at the numbers for a fully defensive city, that is, one with a habitation centre and five shard reactors, using a Shield II, 2 x Heavy Beam II, 2 x Laser III, 2 x Rail Cannon II setup – my basic setup of mixed weaponry. For my entertainment, and for the enlightenment of any player reading this, who is not mathematically inclined, I've decided to put down my line of reasoning rather than jumping to the conclusion. Don't think for a moment that I sat down and spent a long time figuring this out. Copious handwaving and rough estimates were used, with the result that it took considerably longer to write down in a comprehensible matter for the AAR than it took to reach the conclusions in the first place. The mark 2 shields were 6*2,400,000 = 144,000,000 points, which corresponded to 24 L3 forcefields of 600,000 points to destroy them all, with the difference that while overlapping they did not all cover the same space, so effective protection or anything – even something right next to the hub and covered by most forcefields – would be substantially lower. It followed that the best position to locate something in need of serious protection, such as a Mil3 stations to take the example which suggests itself, would be next to the defensive building farthest from expected primary enemy entry wormhole on the side that was between the hub and the building itself, if there was any chance of an enemy coming at it from the sides or behind, and on the side that was away from the hub if not. A rough estimate based on looking at the sizes of the shields at maximum extent suggested that one would have to be lucky to get much more than around of a third of the total shield strength supporting anything that the AI specifically liked to target, even if optimally located. In other words, a command station, regardless of its position under the shields, was likely to go down while a considerable amount of shield power remained – but it would still require enough firepower to take down something on the order of eight level three forcefields before it died. This would be subject to considerable variation based on the range of the incoming damagedealers' weapons, but as a rough estimate it would have to make do. The shields would also provide excellent protection for turrets due to not reducing their damageoutput, though this had to be weighed against the value of a having a clump of turrets at a greater distance to slow down the enemy while being pounded by both turrets and city, and doing all the damage to the turrets, suggesting different strategies depending on the topology of individual planetary systems and the overall defensive plan. Hitpoints: 6*2,000,000 = 12,000,000, which was considerable, corresponding to 500 Needler III turrets, but compared to my standard first obstacle for incoming waves at the tanking chokepoint of all mark 1-3 Lightning and Flak plus all Gravity 1 turrets (using Gravity II and III to slow the way to reach that point, and the 1s basically as damage absorbers to increase the longevity of the damagedealing turrets), plus all tractor 2 and 3 turrets, it was only ~110% of that.... Now, the shard buildings had type polycrystal rather than type turret, which would make some difference, but still, it was obvious that anything capable of defeating my regular unsupported defenses at the tanking chokepoint should be able to defeat this without effort, though it would take time. Main beams: 6 x 120,000/8s for 90,000dps total, range 19,000. Heavy beams: 6 x 2 x 6 x 20,000/6s for 240,000dps total, range 27,000. Lasers: 6 x 2 x 4 x 12,000/8s for 72,000dps total, range 23,000. Rail Cannons: 6 x 2 x 24,000/6s for 48,000dps total, range planet-wide. That looked sort of impressive. Even when compared to the firepower of a full caps of all mark 1-3 turrets, it looked pretty darn impressive and covered several damage types while having most of its firepower in close range and still being able to pick off distant targets. Main beam, maximum individual targets 45/minute. Heavy beams, maximum individual targets 720/minute. Lasers, maximum individual targets 360/minute. ....but not that impressive. It was clear that an unsupported fully defensive spire city would die swiftly to any of the Mad Bomber waves I was facing, as it wouldn't even be able to kill off significant amount of the fleetships (bombers, zenith electric bombers, missile frigates) that the AI threw at me in their thousands before the scores of starships (primarily bombers and plasma supported by flagships) primarily) put an end to it. The higher the AIP and hence average level of AI waves, the less impressive it would become as enemy ships become tougher. Not that a fully defensive spire city would ever tank waves unless a warp jump guardian got close to it, but it might end up tanking CPAs and comparing with wave mechanics gave me a good baseline feel for the strength of the city. As a conclusion, what we had got here was something really tough, and something that would easily be able to chew up starships that got close if not too many arrived in firing range at the same time, thus allowing the city to concentrate fire. When facing many thousands of incoming enemies, even throwing in the additional hitpoints and damageout of turret support it was unlikely to be enough to survive on its own. 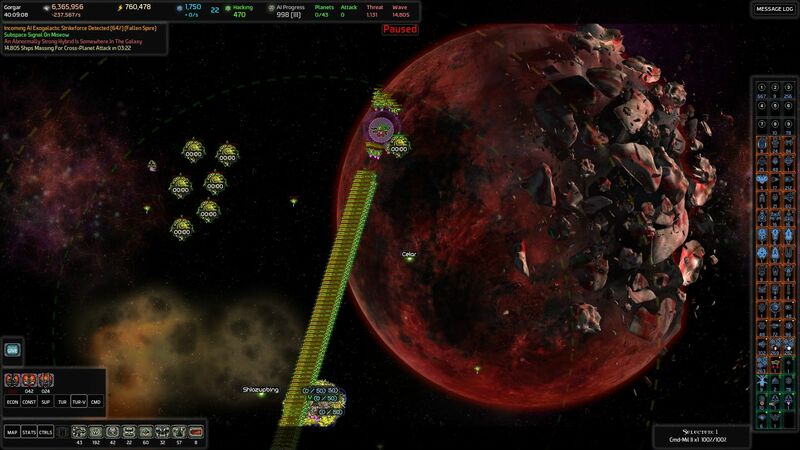 In other words, a spire city would be a substantial addition to the defense of whichever planet it was on, especially strong for providing substantial protection to the station on the planet without tying up forcefields, but it would not be capable of substituting for a true defensive setup with gravity turrets to slow incoming movement, mines, and forts. After a slight recovery period from the prior CPA, it was time to make new plans. I had Spire City Alpha with three shard reactors tanking in the entrance of cluster 2 and Spire City Gamma with a habitation centre, a shard reactor, and four shipyards in the interior, for a spire fleet of 2 cruisers, 4 destroyers, and 20 frigates. Which given what I'd just faced in synchronized exowave, ordinary waves, and CPA, just didn't seem all that impressive. I took this opportunity to streamline my ship production, moving all docks, mercenary docks, starship constructors, and all mark 1 and 2 engineers to the Spire City Gamma, while retaining all the mark 3 engineers in one control group for quick deployment whereever needed. All production facilities were ordered to send directly to Spire City Alpha. Still, before I could do anything about that, I'd take ruthless advantage of the hacking changes! The first thing to go was the Special Forces Captain's supply of Spire Stealth Battleships. Corrupted and GONE forever. Boy, did that feel good. Given my emphasis on killing at range and letting the AOE lightning warheads deal with larger problems, the battleships with their radar dampening and absurd high hitpoints were a major problem. Overall, the strategic situation pointed to setting up the next chokepoint on the planet the original plan denoted Spire Hub Beta, thus allowing me to remove the AI presence from around Spire Hub Alpha and grow it to a level 2 city. Of special note, the waves were smaller than in the previous patch, the Mad Bomber's down to between four and five thousand, and the Special Forces Captain's down to roughly two thousand, which meant that my fixed defenses were entirely capable of dealing with them on their own; this would probably not last as AIP increased, but it was nice to be able to once again operate my fleet with impunity without having to be ready to hare back to the chokepoint just in case something went wrong on a regular wave. As I was happily wiping out enemy planets to set up the situation in Spire Hub Beta, the Special Forces Captain AI unlocked yet another set of toys, one of which I had heard nasty stories of on the forum: Eye Bots. The first wave I saw them in action left me underwhelmed. Slaughtered by the fixed defenses in next to no time, they accomplished nothing whatsoever. The second time the fixed defenses chose to target differently, and the Eye Bots swept in to take out the station in a surprise coup. That made me a believer, and my next hacking target thus nominated itself. With a bit of preparation I set up a corruption hack for the Eye Bots: Good riddance to bad rubbish. Eventually everything was in readiness for my new chokepoint. 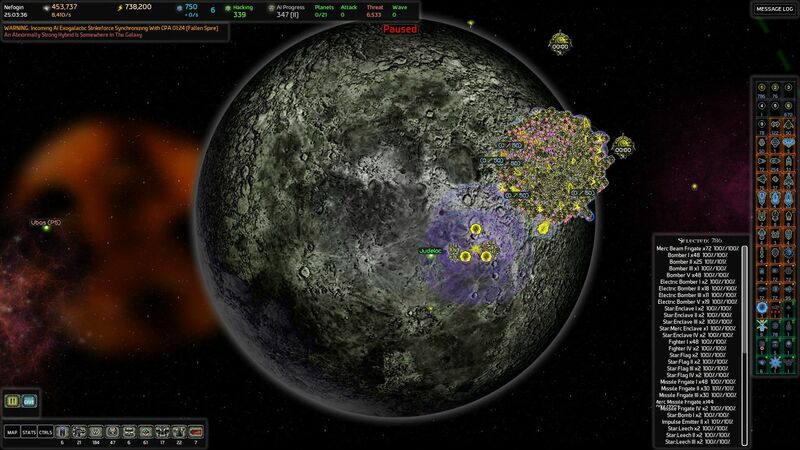 The following screenshot shows it early under development. When completed, it featured full caps of the mark 2 and 3 forts, with the mark 1 forts left behind in Spire Hub Alpha to guard the entrance to the homeworld. Spire City Delta and More Hacking! With the exit from cluster 2 plugged and the neighbouring planets of Spire Hub Alpha purged of the AI, I built it up to level 2 with a habitation centre and five reactors, changed Spire Hub Gamma to a habitation centre and five shipyards, and awaited the next Fallen Spire exo, which showed up in due time only to be destroyed in a matter of minutes. Alpha: Habitation and 5 reactors. Gamma: Habitation and 5 shipyards. Delta: 2xHabitation, 2 reactors, 2 shipyards. Spire fleet: 7 destroyers, 3 cruisers, 32 frigates. The reason for the extra habitation centre being the fat 1,000 metal/s bonus. Since I couldn't build another shipyard without another reactor, I'd have to wait until the next city completed to increase the number of shipyards, so better get full use of the free slot until then. The next signal was tracked to Ullik, the Advanced Factory planet that I had hacked in cluster 2 – but now cut off from the AI by my chokepoint in Spire Hub Beta. Given that the situation felt very stable, I decided to take this opportunity for a fabricator hack in AI territory near the centre of cluster 3, since I could always fall back three warp jumps to Spire Hub Beta if necessary. There were two high-value targets: One planet had the Flagship V and Youngling Vultures, the first of which I greatly desired, the second not, the other planet had Experimental Engineers and Plasma Starship V, for which the same could be said. The special forces by this time numbered 72,000 ships, having grown well beyond anything I could possibly think of to contain them since I had ended my regimen of regular culling. They seemed stuck at a cap depending only on AIP, and given how swiftly they'd rebuilt from their last defeat, I was coming to the reluctant conclusion that I would just have to change my plans to ensuring that their path did not cross mine or I might get bogged down in guerilla warfare with the special forces. By contrast, though the spire fleet did add a substantial bonus to my fleet the spire fleet just didn't seem all that impressive. The hack succeeded without hitch and my fleet was graced by the best flagships avaiable. So, based on the great hacking success I'd had, I grew bold. I was still at low enough HaP spent and with large enough a balance that the hacks were minimum difficulty, and though the last hack had used a beachhead of turrets, I probably would have succeded without it. There was a planet, a distant planet, that held the secret of Sentinel Frigate V's, which would provide a valuable addition to my navy, as I'm sure you'll agree. Well, when I say distant, it was only 7 small hops from Spire Hub Beta. That's not all that far, surely? 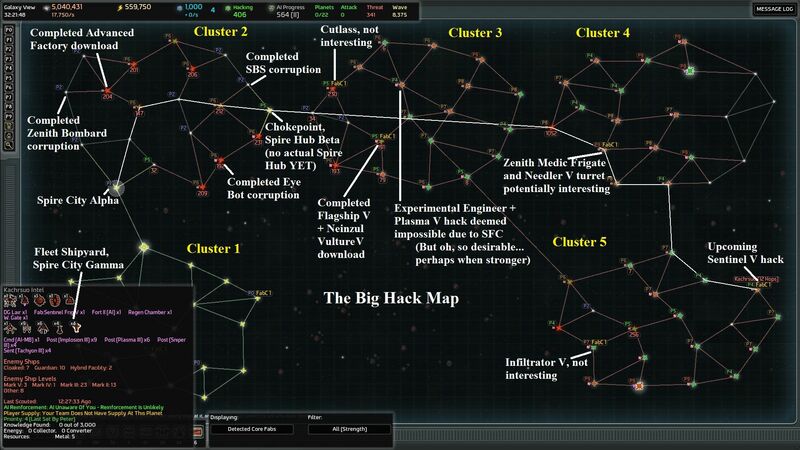 Time for the big hack map! For the greater glory of man, said the admiralty. For Spire Hub Beta two waves, said the AI. I am two thirds of the way to the target and won't be able to return in time and two near simultaneous waves will crush my defenses, and I realize that I've forgotten one slight detail: building up a sufficient stock of lightning warheads in Spire Hub Beta, and since all the mark 2s and 3s are produced and waiting back in Alpha, I can't produce any in Beta right now (unless I want to detonate those in Alpha), and anyhow, with the cooldown on missile production, I would only have time to produce one. Ah, woe is me, said the player. Well, he didn't actually say it, as soliloquys are not his style when lacking an audience, but he sure thought it. So the player, not being a dummy and recalling that Napoleon's famous "ask me for anything you like, except time", did not necessarily apply in full to AI War, did something else instead: He ordered his fleet to return as a group move, and he ordered the construction of a single missile. Yes, I know. Detonating an EMP warhead may not seem in the spirit of the AAR's theme, but it is effective when you need to buy that most precious commodity: time! 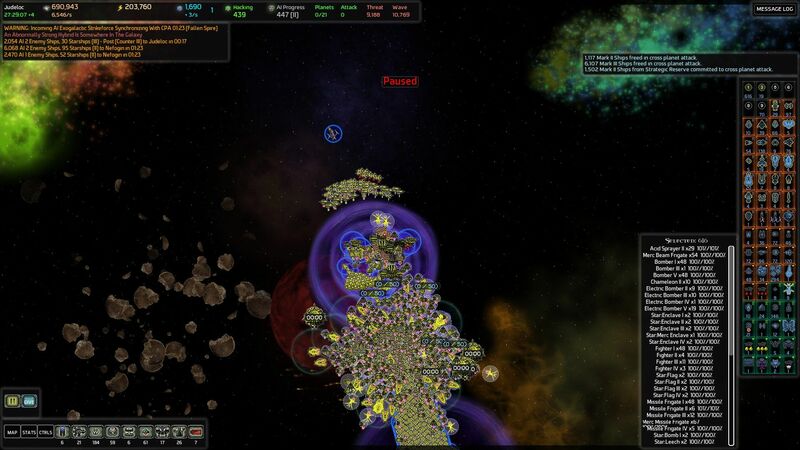 Between the fortresses ignoring the EMP effects and the fleet returning home a few seconds after the stun wore off, the invaders were defeated with entirely acceptable casualties. The fleet was quickly rebuilt, and I set off to get that Sentinel Frigate V hack done once and for all, since I knew I'd have a considerable grace period before the next waves would show up. The exo wave would be incoming fairly soon, but I had considerable faith in my defenses where they that was concerned. 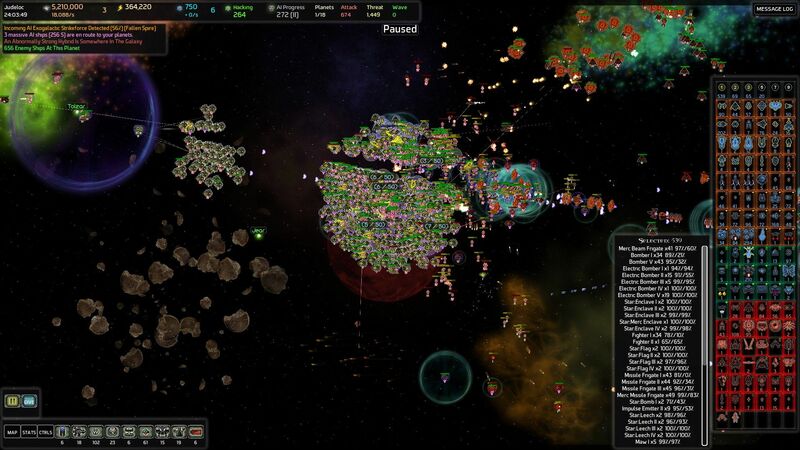 Having destroyed all jump gates in cluster 2 the different groups would spawn in clusters 3, 4, or 5, make their way through the Spire Hub Beta chokepoint suffering considerable attritional damage on their way to the wormhole leading on a shortest path to Spire Hub Alpha and my homeworld, and eventually in broken groups reach Spire Hub Alpha which had a full spire city, full turret caps, 6 mark 1 fortresses, and 19 mixed lightning and armoured warheads on standby in cloak. The hack was successful, the exowave died on schedule, and my returning fleet was greeted by the first full cap of Sentinel Frigate V's, making a grand total of 95 Sentinel Frigates for a guaranteed 29254 dps, which while only a small component of my fleets total potential dps had the significant virtue of being guaranteed at all times and able to be redirected to targets of my choosing on the same planet regardless of location. Time-on-target being, as always, an extremely important consideration. I strongly considered going for a hack on the Medic Frigates and the Needler Turrets (see earlier map) since hacking response was still a moderate 149, but since they were located on a Raid Engine planet and was on the direct route I had seen the special forces traverse in its patrols between clusters 3 and 5, I decided to leave well enough for now and return to the important business of building up the spire fleet. Time to rack up some AIP! I conquered the planets the shard would have to traverse from Ullik to reach the homeworld and extended that path to Spire Hub Beta, building logistical stations to speed my progress and moderate defenses all the way. Not satisfied with that, I conquered the entire route that the AI was using when flying from Spire Hub Beta to Spire Hub Alpha, built logistical stations to retard enemy movement, and lots of sniper turrets to inflict attritional damage to any exowaves passing through. 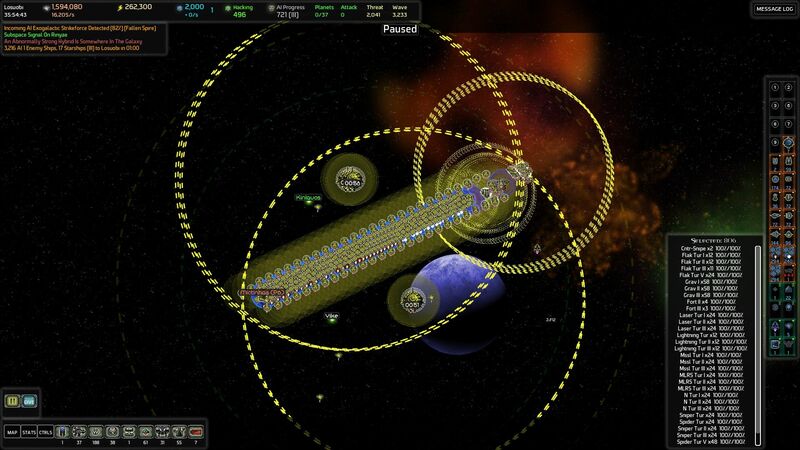 For all these stations I located them at maximum range from the wormholes, such as to minimize any chance of enemy forces merely passing through damaging the defenses. As can be seen, given the warp lane directly from Beta to cluster 4, there's no pratical way of compartmentatlizing cluster 3 the same way clusters 1 and 2 have been. To cut off the AI from 3 would require three spire cities in cluster 4, one of them on a core world adjacent to the Mad Bomber homeworld, and let's just say that if the game ever gets that deranged, the game will have inadvertently morphed into doing the "What AIP memo? ", something I just do not see happening given that I don't have access to trader toys or champion modforts to help fortify my tanking locations. ..Perhaps if I was playing on a lower difficulty setting, because by God, it is tempting... but no. AI War is not about world conquest, it is about pest eradication. (The AI probably agrees. It is just that we disagree on exactly who's the pest and who's the exterminator). Be that as it may, the AI was not amused and pulled a fast one – just after I had constructed the hub itself and was about to being the modules, the AI launched not only the new city exowave, as expected, but a regular wave from both AIs. It felt like it was seconds after the exowave launch, but it was probably more like a minute or three. Whatever the case, since exowaves travel slowly, they arrived with too near simultaneity for comfort. Moreover when they arrived, the sheer mass of attackers in Beta caused the threatfleet to begin piling in, sensing an opportunity. My engineers worked overtime trying to activate some spire city defenses while the fixed defenses and the fleet held off the firstcomers. Even so, there were just too many to conveniently handle. Twelve thousand ships attacking or passing through Beta with another seven thousand incoming. Once again, it was time to unleash the lightning. The following is a screenshot after the first warhead, which convinced me that half-arsed measures of limited escalation were just not going to cut it. At these six verging on seven hundred AIP, waves consisted of predominantly mark III ships, and warheads just didn't destroy anywhere near as many ships as they used to do. This time a mere four lightning mark 3 warheads turned out to do the trick, culling the AI fleet enough that I could hold beta. What's 12 AIP amongst friends when you are having a good time? - Bear in mind you can still cover stuff with normal forcefields. It will get the damage reduction, but you don't have to blanket the whole formation; the MkI forcefields are probably small enough to only cover one city structure, under which you can put the stuff you'd really rather not have die. It's a tradeoff, of course. - On the "maximum individual targets" stuff, bear in mind that both the photon lances (main beams) and heavy beam cannons "punch through" when they kill something, and if there's a valid target further down the line it gets hit with what's left, and so on. In many cases that means the extra strength is just wasted, but in heavy defensive situations there's very often more ships just behind the target, so they eat it, and you can approach optimal utilization of the beams' dps. -- Also, when _any_ shot hits a carrier, it's allowed to kill more than one occupant if it has the damage for it. All that said, even if all the damage was allocated optimally, the sheer total hit points of one of your Mad Bomber waves is presumably an uncomfortably hgh multiple of the city's total dps (even assuming best-hull-type matches. So yea, they don't stand alone against serious attack, they just make great defensive centerpieces and are handy for "you shall not pass!" wormhole-entrance-guarding. The most important attribute a player needs to win AIW on high difficulties is "a complete lack of shame". The first wave I saw them in action left me underwhelmed. Slaughtered by the fixed defenses in next to no time, they accomplished nothing whatsoever. The second time the fixed defenses chose to target differently, and the Eye Bots swept in to take out the station in a surprise coup. Yep, they're basically soft-boiled eggs: if they actually hit serious defenses head-on, splat. But if they can slip through the cracks, ow. Nothing ever goes wrong after someone says that. Anyway, once you have 5 cities and all that allows you to get/build I think you should be able to just start glassing clusters between attacks. Naturally, I could be wrong. Those arachnid guard posts are bad news for capital ships, and would require pre-treatment. Then there's the special forces, which can be handled but would keep it from being an unopposed romp. I was falling behind on posting AAR updates, having this almost "done" for several days, so the next update showing just what happens at five cities - and beyond - should be coming up soon. Let's just say that special forces and wave sizes, even with the recent reductions to reinforcement spillover, are not so easily handled as all that as the AIP skyrockets. The Special Forces say they have no bread? 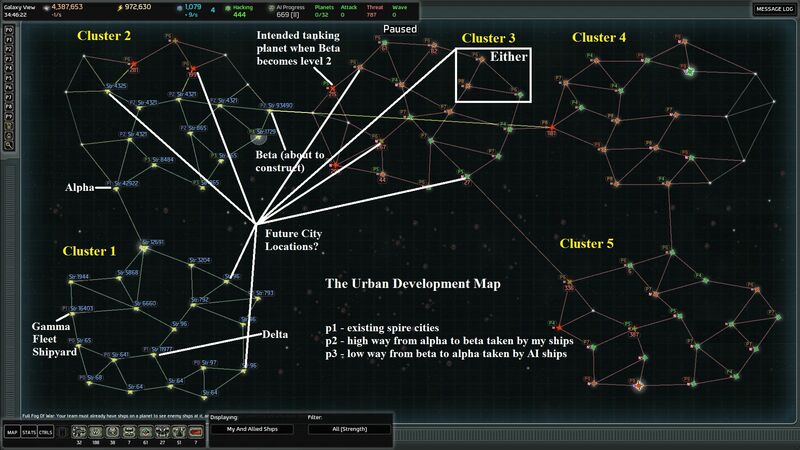 With Spire City Beta built, it was time to build the next tanking location, the planet of Losuobi in cluster 2, only two jumps from Beta, which had a most wonderful property apart from its closeness: the extreme closeness of the AI entry wormhole to one edge of the map, allowing the placing of the military station immediately opposite and resulting in the longest firing range yet, taking up fully 832 of 882 possible mines to lay a three-broad track of death from the wormhole to the cluster of flak and lightning turrets. Or at least as beautiful as it gets without trader toys or champion modforts. The thought of adding a Radar Jammer II to that setup, which, all by itself would ensuring that anything flying down the central avenue would not have the range to shoot the gravity turrets, thus winning extra time from the AI diverting ships to fly out to kill them, of Orbital Mass Drivers killing off incoming starships, and so on and so forth. But that's wishful thinking. Given the tools available, it was just about as beautiful as I could make it. The Vorticular Cutlass Fabricator was not long for the world, but then, I didn't really have a need for such a close range weapon in the first place, which is why I didn't hack it. Once this was set up it was time to sterilize Samuus in cluster 4, the planet adjacent to Beta, and the origin of the beta waves, and following that beta was completed to specifications, making Alpha and Beta full habitation/reactor cities, and Gamma and Delta full habitation/shipyard cities. The next shard turned up on Rinyae in the depths of cluster 1, a planet that had also been the site of an earlier shard, and it was easily recovered. Exowaves were becoming fairly large, as an example the one at 36:06:04 had 69 massive ships with 40,318S (whatever that means), but fairly easily handled so long as the fleet was in support of the fixed defenses at Beta. So, having recovered the fifth shard, did I immediately go ahead and build Spire City Epsilon? No, I did not. In retrospect, that was probably a mistake and I should just have gone right ahead, or, perhaps better, have glassed a handful of planets to be able to perform the first major unlock, but under the circumstances of my knowledge at the time, it made excellent sense. The journal entries and my own experiences had made clear the ever increasing AI response to Spire Cities, and the journal entry I got after Beta, the fourth city, told me that the fifth would unlock larger hulls and advanced technology if I had the knowledge to make use of it, and that I'd have reached a level where the AI would be really, truly, pissed off. Also, I knew from the spire hub construction menu, that five cities would give me access to a Galactic Capitol, which would piss the AI off even more. What was not clear, and understandably so as this was a warning, not a roadmap to victory, was how soon I'd need the benefits granted from that tech: How much would the AI aggressiveness increase? Would it do something really special to compensate for the human gaining this potential access? Not knowing, I decided to play it safe by accumulating knowledge beforehand, but how much? I set myself a goal of 30,000 knowledge, which I expected to be more than enough, and began my eradication campaign. I did not want to eradicate any planet with a design backup I might potentially want to eliminate, and as I was close to yet another AI ship unlock AIP threshold, I kept a close eye on the design backup map as I soon crossed that threshold. The Special Forces Captain got Autocannons, which being short ranged sounded great to me, and the Mad Bomber got Protector starships. Since the Mad Bomber almost always sent bomber waves, I did not consider this a dangerous unlock for the AI or the hybrids, but I did consider it a good unlock for me. I had negligible experience with it in actual play, but starting a quick test game with Protectors as the ship of choice and immediately investing knowledge to unlock up to mark 3 revealed that it was a fun toy. I immediately invested knowledge in unlocking to mark 3, this adding another two planets to the total that needed to be wiped out before building my fifth spire city, and adding marks 1-4 of protector starships to my navy, configured to countering the Mad Bomber's damage types in order, on the rational grounds that the Mad Bomber was way more dangerous than the Special Forces Captain on the offensive. The first ordinary wave greater than 10,000 ships came at 36:57:27, when the Special Forces Captain sent in a wave of mark 3 ships (766 AIP) that rather worried me until I realized that it primarily consisted of Autocannons. Considering the firing lane facing them, they didn't stand a chance. The next event of any greater interest was my destruction of Harbi, a planet that I had failed to duly acknowledge the importance to the AI of. It contained a Planetary Armor booster, and I was merrily slaughtering its guardposts when the special forces began warping in in ever increasing numbers. I got out of there in a hurry. Based on this experience, it seems that the special forces cap for 822 AIP on difficulty 9 is at least 112,000 ships. 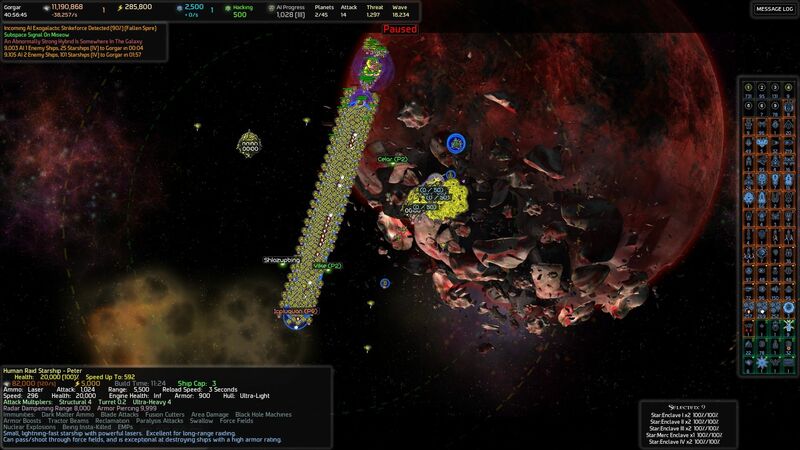 To cut a long story short, I continued my extermination campaign, defeating ever larger AI waves that now reached sizes that mandated the return of my fleet to the tanking planet whenever two waves synchronized, the defenses being unable to cope alone with the 12-14k ships of marks 3-4 they faced in those situations, though fortunately still able to deal with single individual waves. And then there was a CPA synchronizing with FS exo, but by then, it was old hat. Been there, done that, fried the T-shirt. 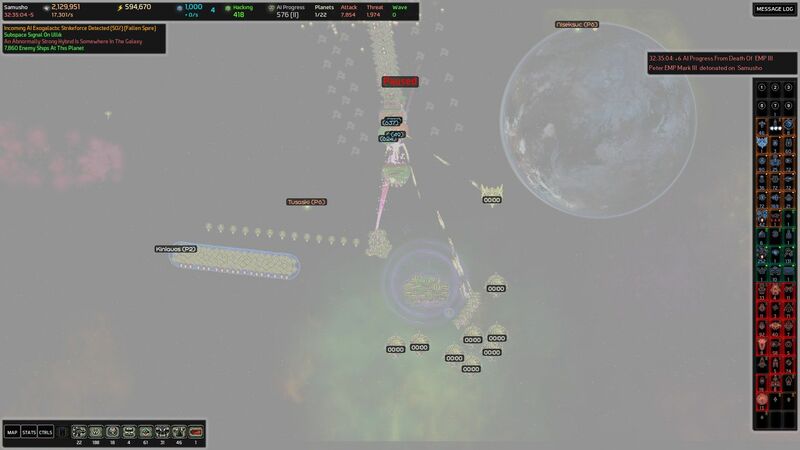 By 37:47:30, as my fleet was out of position due to glassing a planet, and I was being assailed by enemies on all sides due to a CPA, and had to defend Beta and Losuobi at the same time, and as the special forces were becoming every more annoying to dodge due to the decreasing area they had to protect, I decided that I'd had just about enough, even if I was still 1,250 knowledge short of the 30,000. It was time to break out the lightning on two planets at once to get the situation under control. And then I said to myself, that wasn't so bad, was it now? Not knowing just what the hell would happen once I got started on the fifth city, perhaps I should go hack that Medic Frigate V now, that I'd been considering on and off for the longest time? It was only 149 ai response, so it should be doable without any sort of beachheading so long as I parked a spire destroyer or two on top of the hacker to shield it. It would take ten minutes tops to pull off and return. So I went and did that, and my fleet sported Medic Frigates V soon enough, assisting the Protector and Riot Starships in keeping the rest of the fleet shipshape. Which is how I was reminded that there was also a Needler Turret V on the planet, so my one hacked count as two, and the total HaP I had spent on fabricator hacking skyrocketed, but at least I could now add Needler V turrets to my tanking hotspot. Having now spent a grand total of 894,24 HaP out of 1343, all the hacks under 7.034-35 being moderate until now (and my increase in firepower between each hack more than making up for the increase in difficulty from the hack floor rising), the curve had finally caught up with me. If I performed another hack at this point, I'd face a 405 ai response. NOT BLOODY LIKELY. On the positive side, given that ai response now decreased linearly in HaP gained, I was not cut off from hacking for the rest of the game: All I had to do to bring this down to tolerable levels for one more hack would be to destroy another 5-10 planets. Sure, a stiff price to pay, but those are the breaks. Nobody said it had to be easy – only possible – and I'd been hacking quite a lot. Of particular interest is that it was at this time, at 977 AIP, that I finally accepted that my fixed defenses were no longer sufficient to defeat solo Mad Bomber waves. It was no longer the exception but the rule that I had to bring my fleet back help deal with those 10,000 ship waves of mark 3-4 ships, even when not synchronized with a Special Forces Captain wave. I had nearly every defensive tool available in the base game on that planet set up in a fairly strong defensive position, something that was utterly impossible to replicate on any other planet due to galactic caps, and even that wasn't enough. I could move the six mark 1 forts and the human modfort that I used in support of Beta to the planet, but at best that would give me a grace period that would all too soon be eroded by increasing AIP. BE THAT AS IT MAY, by 39:08:49, after the defeat of the next synchronized CPA and exo, and with the regular waves recently defeated, I did at long last build Spire Hub Epsilon back in cluster 1, and was told to build a Galactic Capitol, the building I'd been waiting for every since I first saw it listed in the spire hub construction list. I built the Galactic Capitol in Spire City Beta and got a very durable seat of government with one monster of a gun attached – or perhaps it is a monster of a gun with a durable seat of government wrapped around – opinions differ. And had 1750 left over, missing the unlocks for Colony ships, Rail Cannon IV, and Plasma Siege Cannon III (for which I also lacked the prerequisite tech). Thus the 30,000 knowledge I had expected to be ample and of which I'd collected 28,750 before calling it a day turned out not to be enough in the end, 36,000 being required to unlock everything. Though why on earth anybody would unlock the Plasma Siege Cannon is beyond me. There's no way anybody would be firing at the armour types it has multipliers for often enough that it is worth using over the HBC IV. Theoretically I guess you could use it for taking down force fields with the x10 multiplier, if you were okay with using a main weapon slot for something only rarely useful, but given its short range, by the time you'd be in range with a Spire fleet to use that weapon to take down the force field with its awesome 120,000 damage/8s, your host of Spire Frigates would be in range to range it down with their main beam weapon doing 40,000 damage/8s per frigate. Sure, it could spread 6.25% damage to each of up to 25 targets under the forcefield, but compared to the damage the HBC IV would deal in all situations? Choosing the PSC would be madness. So either I'm missing something obvious or the Plasma Siege Cannon module is utterly worthless in all of its variants, and having an unlockable mark III only adds spite to injury. Be that as it may, my first task was to upgrade the lasers and shields on all frontline shard reactors and habitation centres, the second to reorganize the fleet, and the third to knock over an extra planet to get the knowledge to unlock Colony Ships. With the sheer numbers of spire ships in the fleet, the old designs for destroyers and cruisers that mixed beams, lasers, and rail cannon was passé. Since fighting in close was so terribly dangerous given the numbers of quality enemy ships I was facing, and since I'd been doing quite a bit of kiting/strafing with my fleet to deal with the larger assaults, and since furthermore the enemy had started fielding both snipers and sniper frigates in the hundreds, I'd build the fleet to focus on that by a massive expansion of my own sniping capabilities, while still maintaining enough close range firepower to deal with emergencies, and with an overall focus on strafing alongside an enemy wave headed for a command station, just beyond missile frigate range (due to the Mad Bomber typically sending one to two thousand missile frigates with each wave). Cruisers likewise to become long range platforms, with 2xRail Cannon II, 4xRail Cannon I, 2xLaser II. 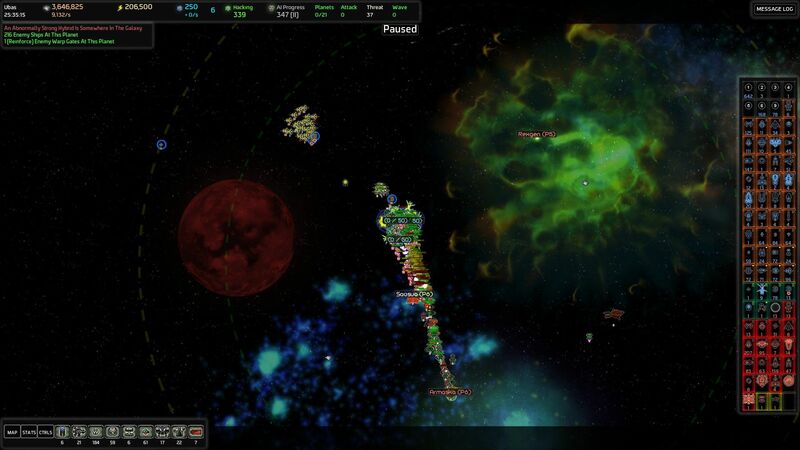 Continue building a larger spire fleet and eventually taking the fight to the AI. Naturally, I decided that I'd try doing things my own way first rather than calling in help. I had lots of room in cluster 2 to build more cities and having a larger spire fleet would be fun! I estimated that by the time it reached 2-3 times the current size, it would probably make sense to strip all Battleships and Dreadnoughts of all HBCs of mark 1-3 and replacing them with the highest mark Rail Cannons available, leaving only the HBCIV toting Dreadnoughts beam-capable. 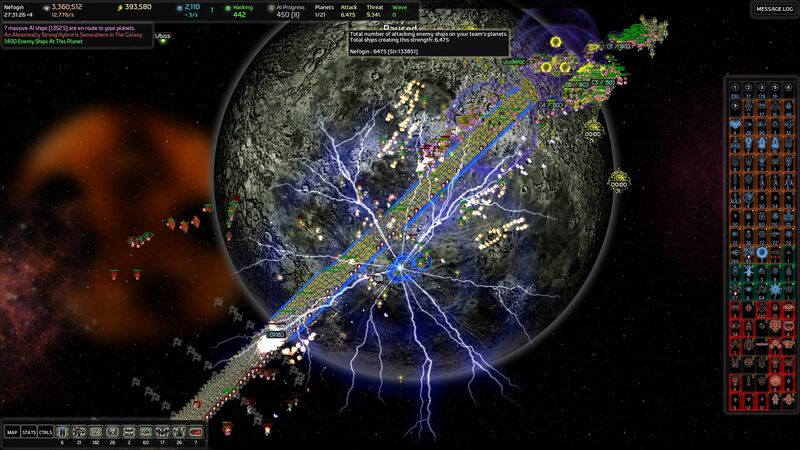 I projected that by that time the main beams from the spire fleet would be so many and so frequent that they would by far dominate the total close range damage output of the entire fleet (spire ships, fleetships, and starships taken together), and that moreover, with increased fleet-ball size spire ships on the far side of the fleet ball from the enemy would have a harder time keeping the enemy in range of beams unless I let my fleet fly dangerously close to the enemy, which taken together would make getting additional long range Rail Cannon capabilities a substantial improvement over marginal close range improvements. The sole exception being the HBCIV because of its huge qualitative dps improvement and ability to pick off many weakened ships with minimum or no overkill. 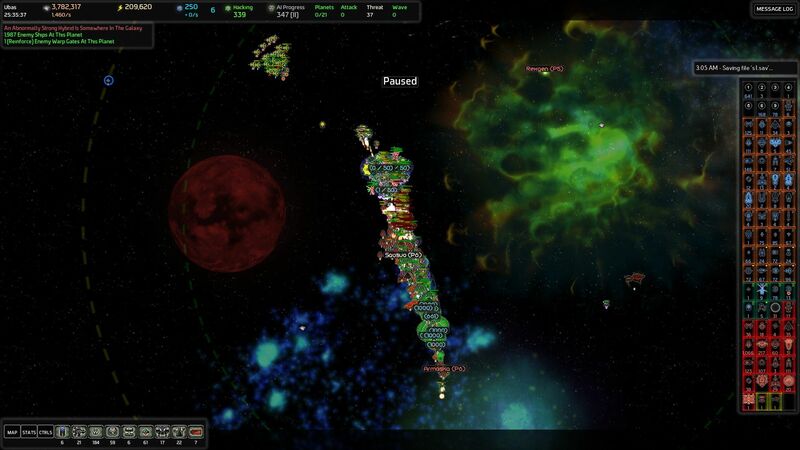 I know that not everybody would reason like that, and an argument can surely be made for maximizing the kiting/strafing and close range power by maximizing beams in the fleet, but I have always been a great believer in diversifying my strategic capabilities rather than focusing on single powerful approaches, and it has overall stood me well in most strategy games. Building the major ships took some time, but they were definitely worth it, as I learned how to perfectly strafe the incoming waves by moving back and forth along a line parallel to the road of death outside the range of most AI ship and how to kite pursuing ships slowly enough that they faced the brunt of rearwards firing spire beams. At this point, 977 AIP, the Mad Bomber's waves typically consisted of 8-9k ships, roughly evenly divided by marks 3 and 4, so the added firepower was greatly appreciated. The Special Forces Captain was more modest, only throwing 4k waves at me, but it typically included 200-300 Snipers and Sentinel Frigates amongst its fun toys. 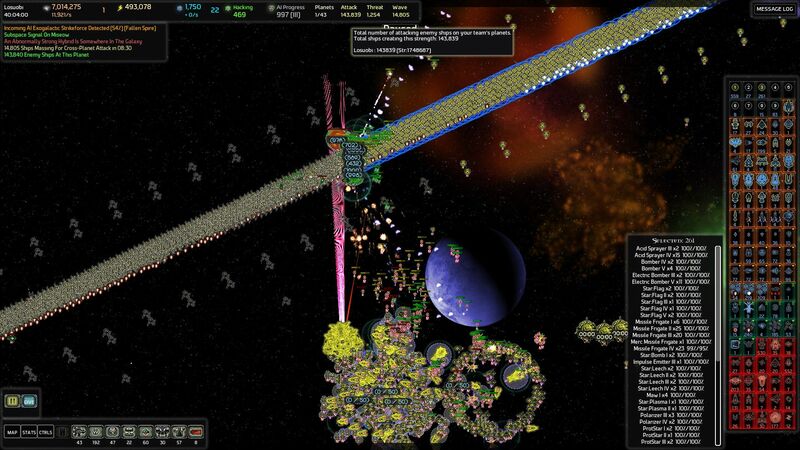 In lieu of perfect anti-sniper coverage, I approached this issue by having all my own Sentinel Frigates, Spire Destroyers and Cruisers, and all seven forts on the tanking planet open fire on the enemy long range units the moment they spawned, this resulting in a rapid decrease in their appalling numbers. Great fun was had for several waves until it became routine. This screenshot is from the last routine wave, where some 9,200 ships had been whittled significantly down before ever reaching the flak/lightning defenses – and the last screenshot I have from before the game turned decidedly weird. This section contains AI behaviour that I do just not understand. I thought I had understood the rules governing the Special Forces – moving back and forth between various AI planets by shortest-path routes that tried to avoid heavily defended human planets as default behaviour, and moving in to support critical AI planets whenever human forces were present. The problem is that what happened next fit none of those two patterns. 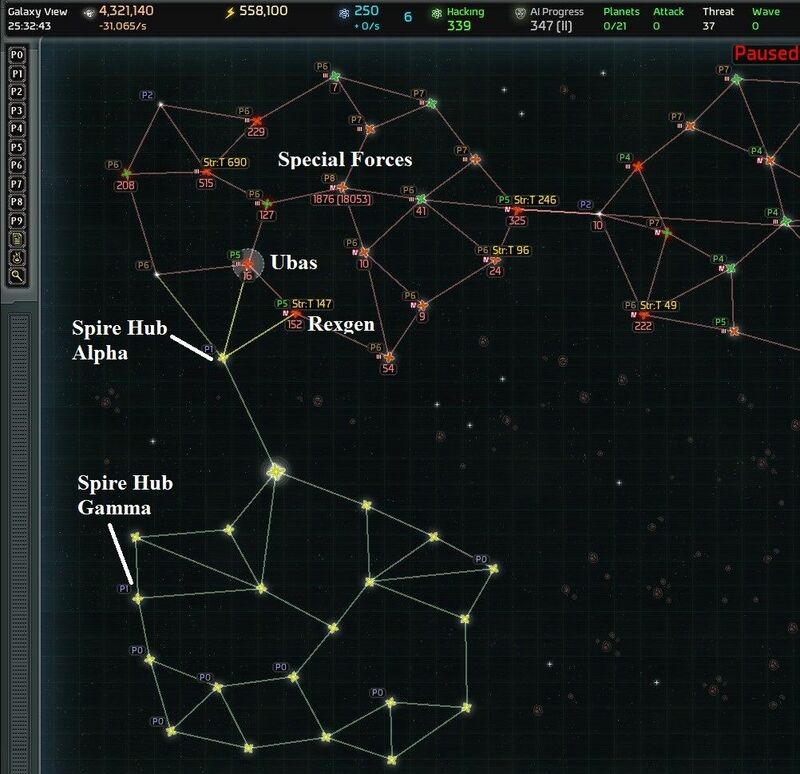 As I was completing the defeat of the major wave shown in the last screenshot, I noticed on the galaxy map that the special forces were entering cluster 3, all 146,000 of them (or so). Well, they'd done that before, but most of the time they stayed in clusters 4 and 5 (perhaps not surprising, as that's where the majority of AI planets were by the time). That there were ten times as many enemies present as I'd ever faced at once before. That the framerate took a significant beating. I fought them for two minutes, strafing the formation just as I'd done all other waves, but it was clear that nothing I had could stop them or even seriously inconvenience them. This much threat (1,7 million after I'd killed the first four thousand ships) would roll over all of my defenses and my fleet as well if I tried to stop it. All I could do was harrass the special forces, but would that even matter? If the special forces could, for whatever reason, choose to just go attack a planet of mine for the fun of it, then all my defenses were pretty much meaningless. Lightning or armoured warheads were capable of killing off a few thousand ships, and my fleet backed by fixed defenses would never be able to kill anything but a fraction, should that many enemy ships push an assault. 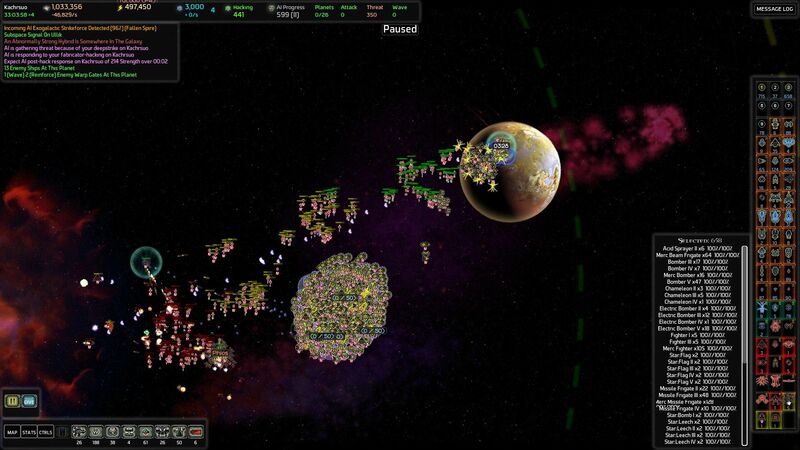 At a cost of 50 AIP and rendering a planet unusable per pop, they'd be able to kill all but the mark 5 ships. With this in mind I decided that since all was not necessarily lost, though admittedly the situation looked dire, I'd begin building up nuclear warhead stocks immediately while proceeding on the assumption that the game was still winnable. I had an incoming CPA 8 minutes away and the Fallen Spire exo charged to 54%. Of more immediate concern, having just defeated a Mad Bomber wave, I was undoubtedly due a Special Forces Captain wave (err, one of his REGULAR waves ), and the one warp-border I had with the AI was minutes from being overrun, with no realistic chance of being rebuilt so long as any AI ships remained. A new location for tanking was urgently needed, and under the circumstances, I couldn't think of a better time to test a theory of mine – that while there was a global cap of only one spire colony frigate at a time, that probably meant that unlike the first five cities, I didn't have to build a hub to level 2 before building the next hub. I immediately set out for the closest planet I could reach in cluster 3 with an adjacent enemy warp gate, which was three jumps away Beta, the planet of Gorgar. Not that there were any enemy planets closer than that available in cluster t3, mind you; Only in cluster 4 were there any enemy planets closer than 3 from beta still in AI hands due to the peculiar geography of Beta's warp lanes and my extensive eradication efforts when accumulating knowledge. Gorgar was the planet where I'd in what now felt like the distant past downloaded the Flagship and Youngling Vulture plans, and four minutes after deciding to break off my futile defense in Losuobi, with another four minutes to go for the CPA, I was beginning building basic defenses with my fleet in support, greatly aided in my swift movement to the planet by the protected logistic stations set up earlier during the eradication campaigns in the bottom half of the cluster. The one AI planet bordering Gorgar had an Advanced Factory, so was one of the planets the special forces really cared about, but under the circumstances, why care? The only important thing was getting a planet for the AI to set waves to. Now, I had had a lot of resources to start out with, but with the destruction of the Losuobi military station, the flow of salvage had dried up, and I had an urgent need of resources. Building full caps of turrets and marks 2 and 3 of forts doesn't come cheap! At CPA +3.22, I was down to 6 million metal with only one mark 3 fort near completion and the remaining forts merely started, so I popped the distribution node in Gorgar. 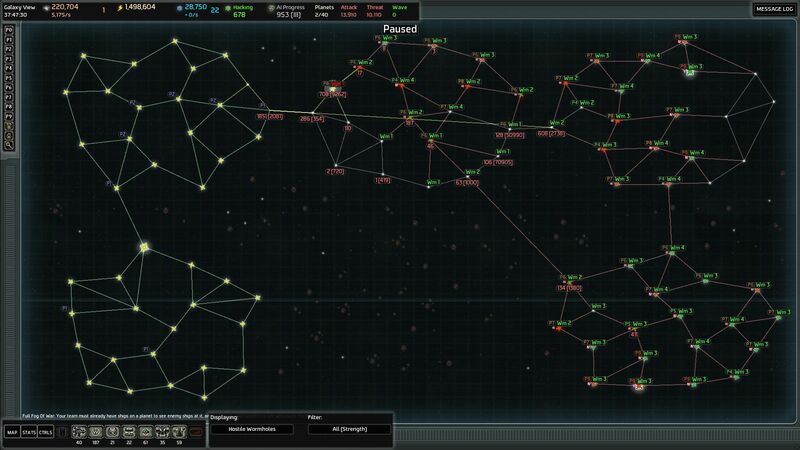 Which is why, for the first time in the game, I found a real need for distribution nodes! I hastily popped the other seven distribution nodes in areas under my control, gaining enough metal for another one and a half mark three for for the paltry price of 8 AIP. Gorgar was now strong enough to deter or at least slow down any incidental push from the threat fleet and any wave spawning in the immediate future would have it as a target, so it was time to return my fleet to Beta to find out just what the special forces had in mind. If the special forces did not continue pushing their assault and returned to something like business as usual, the rest of the forts would just have to be built as resources allowed, and in this situation, I'd also build my sixth spire hub directly in Gorgar on top of the command station, to provide additional firepower. If they did push the attack, it would be time to nuke them till they glowed, then shoot them in the dark, and then pursue a campaign of desperation to finish the game as swiftly as possible, nuking any obstacle that couldn't be immediately rolled over and truly burning the bridges in case of temporary setbacks. After completing the utter destruction of all defenses in Losuobi, they returned to Mictinhas, the planet they came from, and began patrolling back and forth in AI territory as usual, going first for Zinglaos in cluster 4 (a frequent choice). I have not yet found found out what the hell made them decide to go attack a planet that had been mine for over two hours. 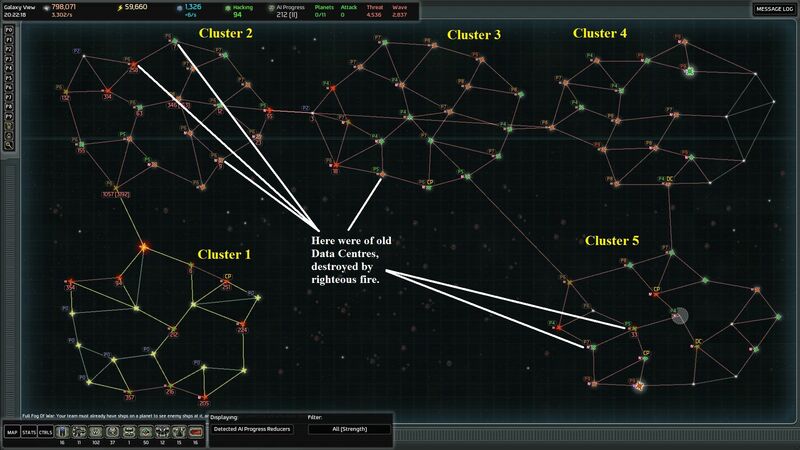 I have considered whether the AI had first been drawn at random to go to Mictinhas, then having reached that location, had decided that a shortest path to somewhere in cluster 4 would go through Beta, and then, having found itself in Losuobi, decided to take out all opposition before moving on to its target, but if that had been the case, why did it turn around after destroying Losuobi and return the way it had come? 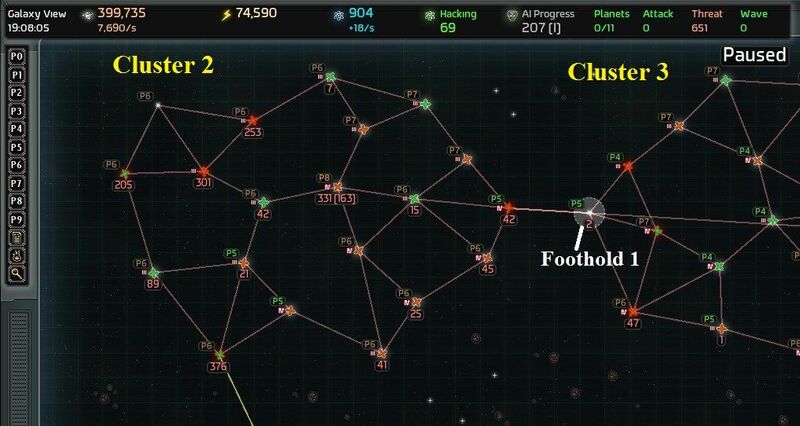 Also, a weakness of this theory is that while cluster 4 is only four warp jumps away from Mictinhas via Beta, it is also possible to reach the same planet in cluster 4 via four warp jumps in cluster 3, all of which were under AI control at the time. Deliberately trying a shortest path going directly through two extremely heavily defended planetary systems? It is obviously strong enough to do it, but it is something I hadn't seen before. If it did that, why did it not react to my earlier moves in cluster 2 at the ARS planet after bottling up the cluster 2 entrance with Beta? Though considerably smaller at that time, the 50-60k special forces were surely as much stronger than the defenses and fleet as constituted at that time than the 147k special forces were stronger than my current defenses and fleet, so looking at proportional strength estimates, why act in one case and not the other? So it remains a mystery, and one I would dearly love to know the answer to. Be that as it may, I had survived. Not knowing why the AI acted the way it did or whether it would do it again, it was unclear whether I'd be better off pursuing one victory type or the other, but it having been graphically illustrated that the only threats that really mattered in this game were the special forces and the frequent regular waves, the CPAs being more of an added annoyance on top of the infrequent exowaves, which by themselves, while nominally dangerous, were easily dealt with by having my entire fleet present when they showed up. The one thing that was clear was that regardless of where I'd be going from here, I'd need more cities, and I'd need them quickly. I'd need resources first, as the construction of Gorgar had utterly drained reserves, but I'd use every resource from now on building building cities, one after the other, until I had enough force that... Well, that the special forces would still be able to roll over the fleet, if I am honest, but at least it would be able to give a better account of iself, should it come to that, or perhaps even be enough for a strike on the AIs home systems backed up by nuclear arms to deal with the special forces. Gorgar, the tanking planet, became Spire City Zeta at 40:37, some 36 minutes after the invasion of Losuobi by the special forces started. Having an AI neighbour, it only became level 1, but as I had expected that did not prevent me from building another spire colony ship to start the next city. Zeta got three shard reactors, all in a long range configuration of shield and Rail Cannons in all other slots, and placed such that all three shields would overlap the military station on the planet. (Which amusingly enough was a military 2 station for the first hour or so of its life, as I'd been somewhat pressed during the initial construction and didn't spend time on reassigning one of my existing mil2's to mil3 – this only happened once things cooled down). 22 force shields – all mark 3, and all normal mark 2, and four out of six hardened mark 2 – defended the clump of gravity 1, lightning, and flak turrets that made up the penultimate defense. Neama, the last open city spot in the home cluster, cluster 1, became Spire City Eta at 40:50, 13 minutes later, with an exo charge of 75%. 68 frigates, 16 destroyers, 8 cruisers, 4 battleships, and 2 Dreadnoughts. Here is a smashing image of Gorgar at 40:56, just before it is hit by 18k ships in dual regular waves, both of which are destroyed at an entirely acceptable casualty rate by repeatedly flying back and forth on their flank alongside their line of advance. The second Dreadnought completed construction back at the shipyards in Gamma during the battle and, sped on by the highway of logistics stations, arrived in time for the kill.